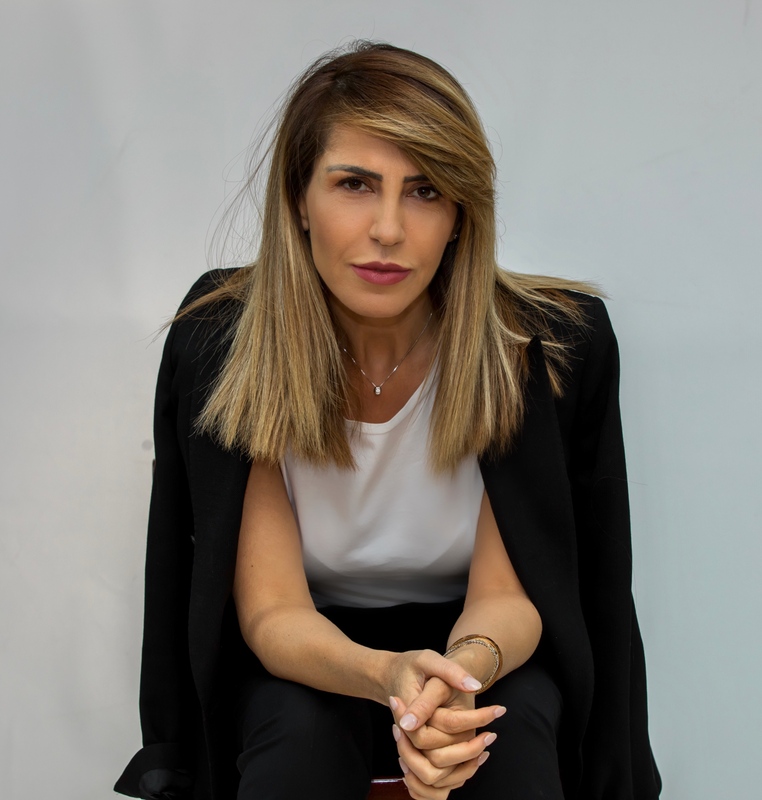 In the interview to women's online Milica magazine, RCC Secretary General Majlinda Bregu talks about the region of South East Europe, successes and challenges of regional cooperation but also about the position of women in the region and being a woman in politics. 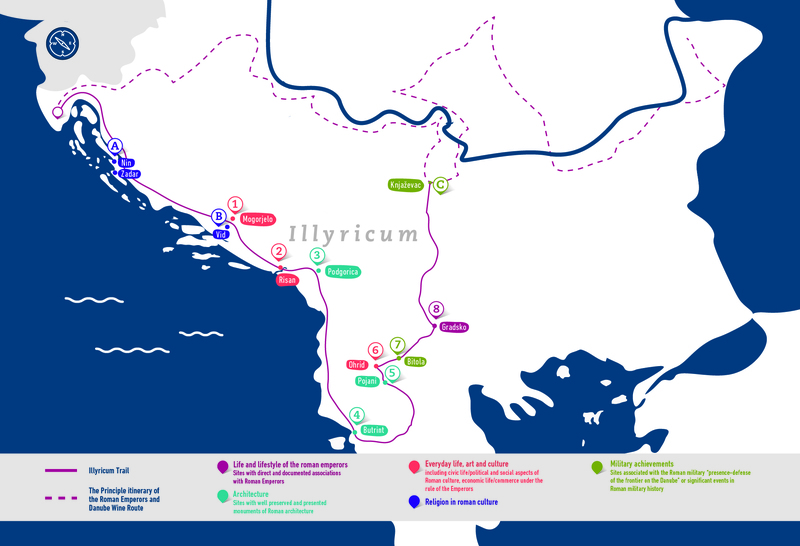 Illyricum Trail is a new and upcoming branch of the Roman Emperors and Danube Wine Route. 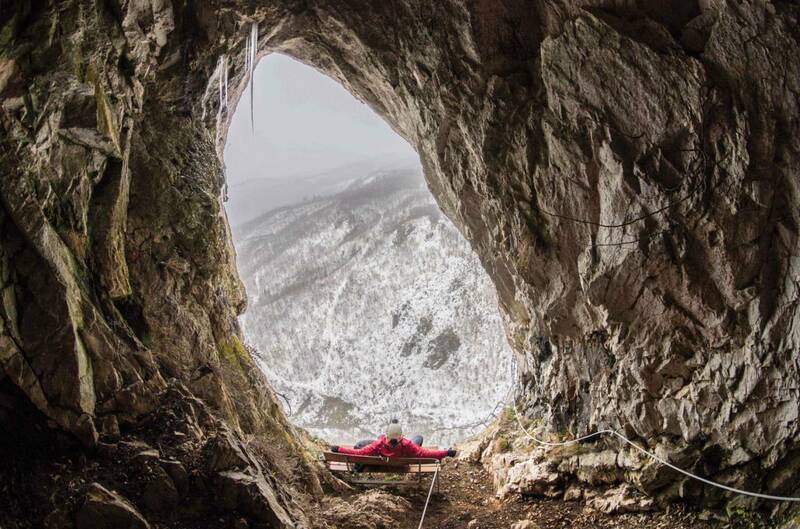 It will run through Western Balkans and take tourists to some of the most mesmerising Roman archaeological sites where they will get to experience culture and history of an empire and immerse themselves in myth and legends of an era. Development of the Illyricum Trail was initiated through the RCC implemented and EU funded Tourism Development and Promotion Project’s grants scheme. Majlinda Bregu, the RCC Secretary General in an interview to Al Jazeera Balkans', 'Tell it to Al Jazeera' ('Recite Al Jazeeri') programme, talks about regional cooperation, achievements, challenges, her vision of the Western Balkans, benefits of the accession to the EU and much more. Regional Roaming Agreement for the Western Balkans: "It means you would be able to speak, SMS or surf more, wherever in the region you find yourself in, and pay much less. No more worries about making sure that your data is off when you cross the border." RCC Secretary General was a guest of 'My living' programme produced by Albanian TRING TV (tring.al). The programme features Ms Bregu during one day in Sarajevo in business and private setting. 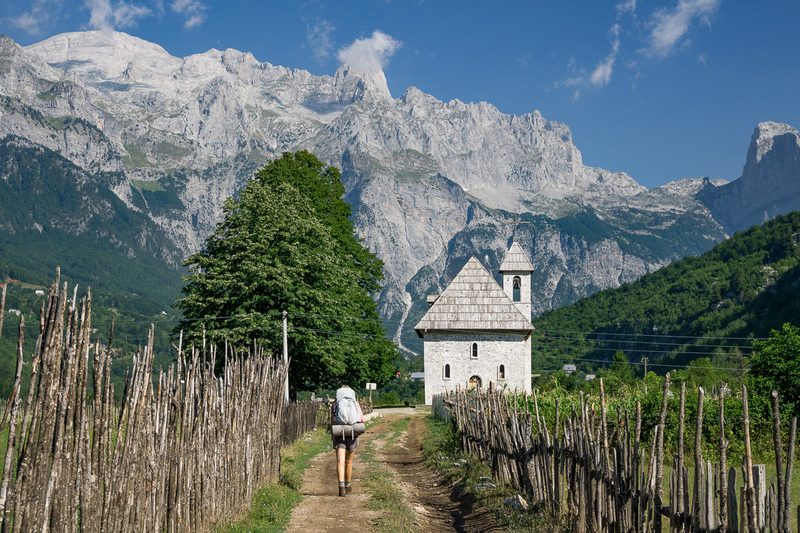 Tourism Development and Promotion: For thousands of years the Western Balkans built its identity on a lavish cultural heritage developed by a myriad of civilisation, which attempted to conquer and rule this stunning corner of Europe. Here you will witness Roma influence, Byzantine churches, Byzantine influence of Ottoman mosques, and Ottoman influence on Austro-Hungarian architecture. For the West, the Balkan was where the Orient began, and for the East it was the getaway to Europe. 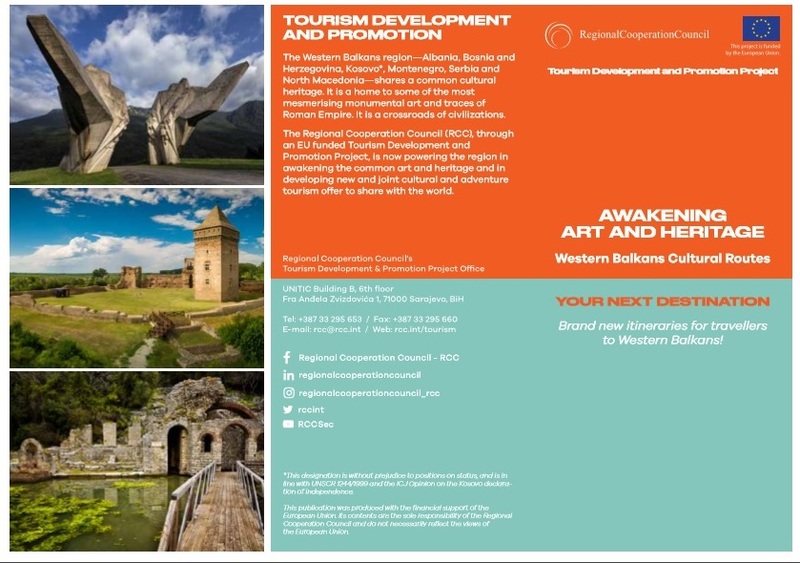 The Regional Cooperation Council (RCC), through an EU funded Tourism Development and Promotion Project, is now powering the region in awakening the common art and heritage and in developing new and joint cultural and adventure tourism offer to share with the world. Tourism Development and Promotion: An artistic route honouring heroic perseverance and creative brilliance. This trail explores 40 most exquisite World War II monuments in the region. Tourism Development and Promotion: A journey to experience archaeological sites and ancient vineyards. 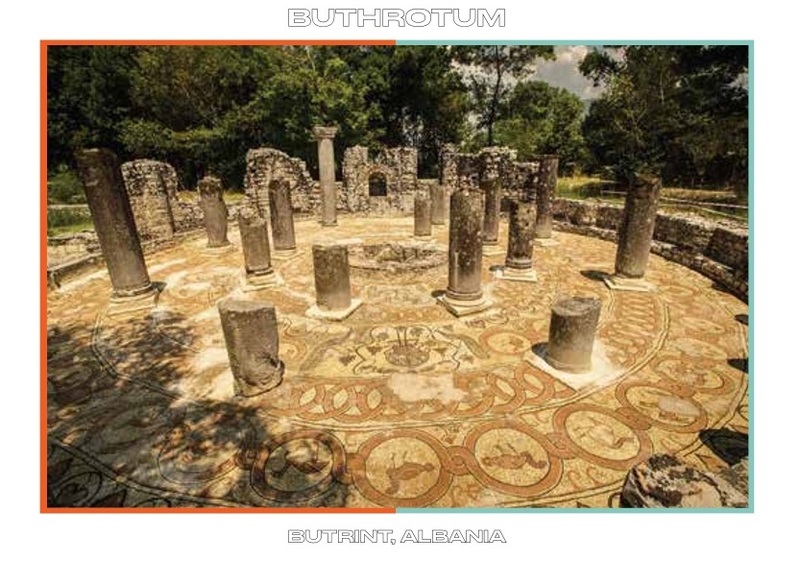 The Roman period marked one of the longest periods of cultural dominances over the Western Balkans. The Illyricum trade takes you on a journey where legends and myths come back to life, along original cobblestone roads, across aqueducts, and in glasses of wine. Tourism Development and Promotion: The Western Balkans region shares a common cultural heritage. It is a home to some of the most mesmerising monumental art and traces of Roman Empire. It is a crossroads of civilizations. This project, led by the Institute of Public and Private Policies, is part of the RCC implemented and EU funded Tourism Development and Promotion Project’s grants scheme aiming to help improve quality of services and infrastructure along the selected routes. The project “Building a Regional Network Across Culture” aims at development and promotion of a new cultural route building on traditional lifestyle, song-sand dances, verbal history, myths and legends, and authentic rituals, cuisine and handcrafts maintained in remote villages in the cross-border region of the Accursed Mountains. This project, led by the Institute for Territorial Economic Development, is part of the RCC implemented and EU funded Tourism Development and Promotion Project’s grants scheme aiming to help improve quality of services and infrastructure along the selected routes. The project “Undiscovered Pearl of Via Dinarica Trail - Mokra Gora Mt.” aims at improving infrastructure and developing and promoting a new cross-border branch of Via Dinarica trail on Mokra Gora Mountain. This project, led by the Microregional Tourism Cluster Subotica-Palić, is part of the RCC implemented and EU funded Tourism Development and Promotion Project’s grants scheme aiming to help improve quality of services and infrastructure along the selected routes. 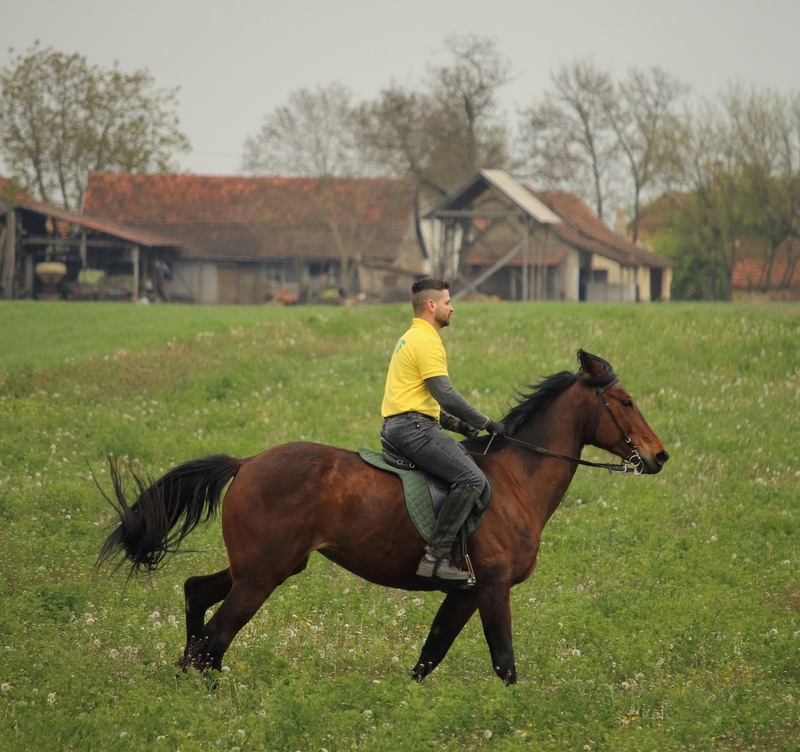 The project “Horseback Riding Trail Across the Balkans” aims at development and promotion of a new horseback riding route spanning over 500 kilometers connecting northern Serbia with southern Bosnia and Herzegovina and networking some 50 farmers (horse keepers) and horse riding clubs as service providers/tour operators and engaging them in the equestrian tourism industry. BiH online magazine BUKA, published an interview with the Secretary General of the Regional Cooperation Council, Majlinda Bregu talking about the economic situation in the region, brain-drain, corruption, unresolved issues, but also about opportunities and necessity of regional cooperation and common European future. 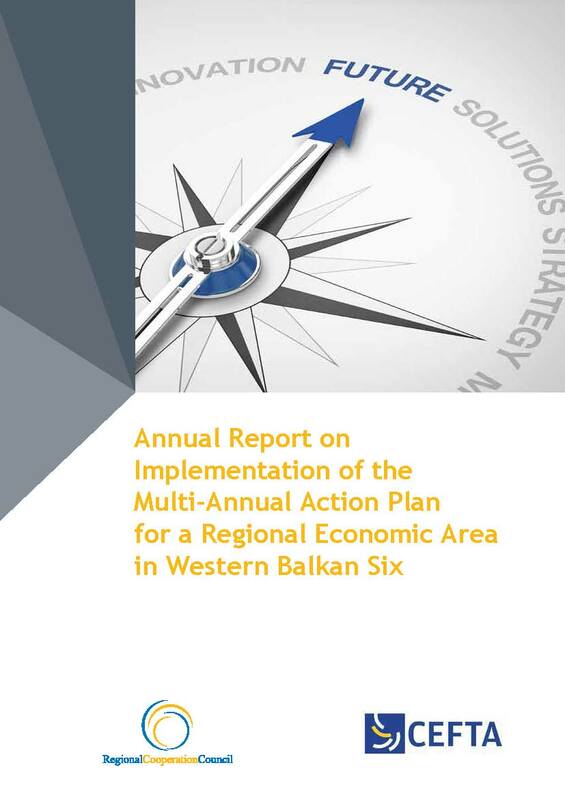 This report presents the key developments during July-December 2018 along the four components of Multi-annual Action Plan on Regional Economic Area (MAP REA) in the Western Balkans Six (WB6), capturing progress and highlighting the most important milestones. The report is prepared by RCC based on the inputs and reporting delivered by WB6 in several meetings (i.e. 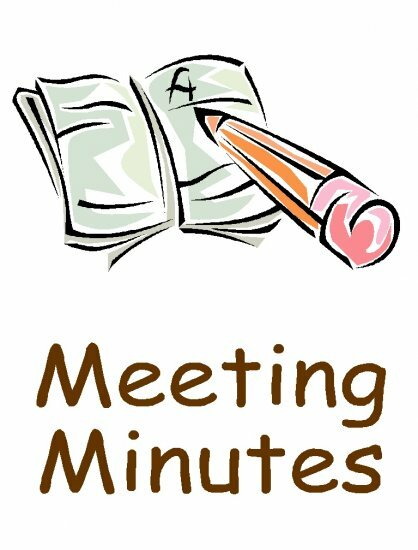 MAP REA Coordinators’ meeting, WB6 PM Sherpas’ meeting, etc.). Terms of References for the Biodiversity Task Force under the Regional Environmental Working Group. 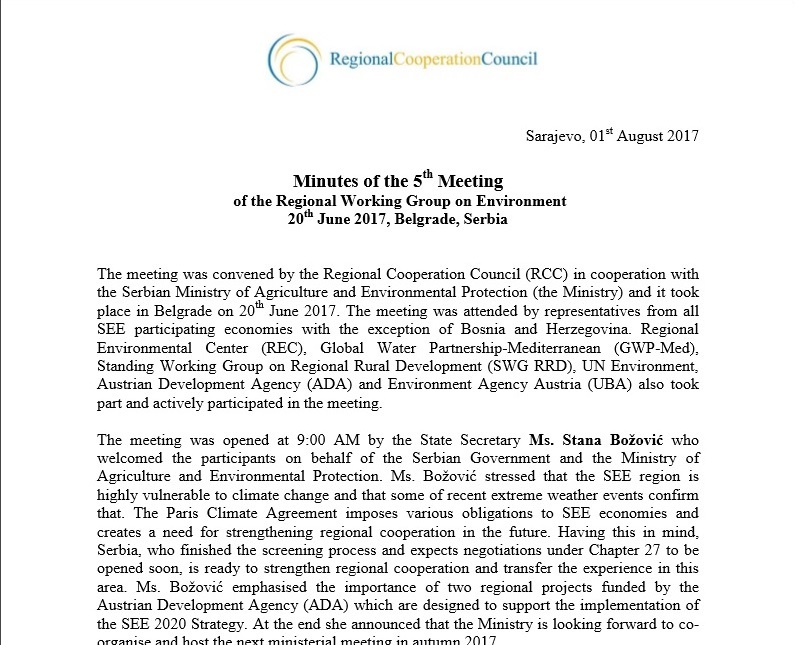 The Regional Cooperation Council established a Regional Working Group of high-level representatives of South-East Europe (SEE) ministries responsible for environment, water resources, land, energy and climate change (hereinafter referred to as “Regional Working Group on Environment” or “RWG Env”) to guide the implementation of the Dimension Environment of the SEE 2020 Strategy. The RWG Env operates under the auspices of the Regional Cooperation Council (RCC) Secretariat with the main responsibility for programming, overseeing and monitoring the activities within the Dimension Environment. The Regional Environmental Center for Central and Eastern Europe (REC) is the Dimension Coordinator in cooperation with Global Water Partnerships–Mediterranean (GWP-Med) and Standing Working Group on Regional Rural Development (SWG). In accordance with foreseen tasks of the RWG Env, determined in Point 1 of ToR, the Group “Propose and/or develop additional mechanisms and tools for effective implementation of activities under the Dimension J – Environment of the SEE 2020 Strategy”. 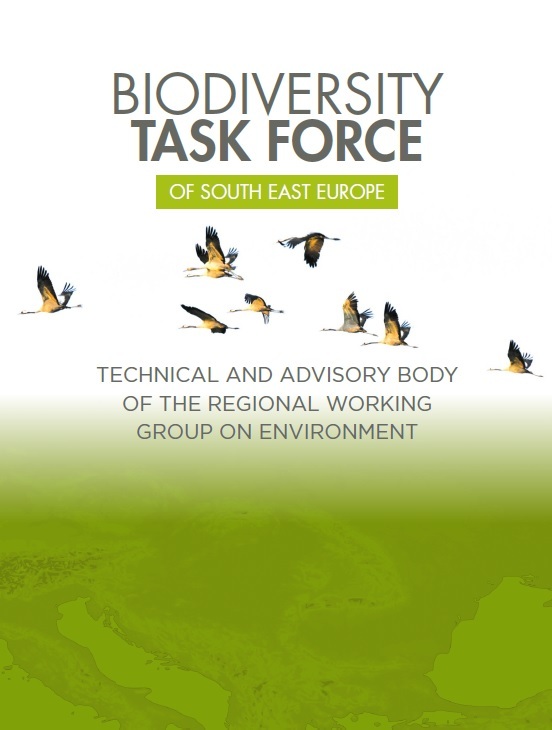 The Biodiversity Task Force (BD TF) is an intergovernmental technical and advisory body of the Regional Working Group on Environment that coordinates regional activities, facilitates the implementation of the South East Europe 2020 (SEE 2020) Strategy and creates a framework for more efficient implementation of biodiversity policies in the framework of accession to the European Union. 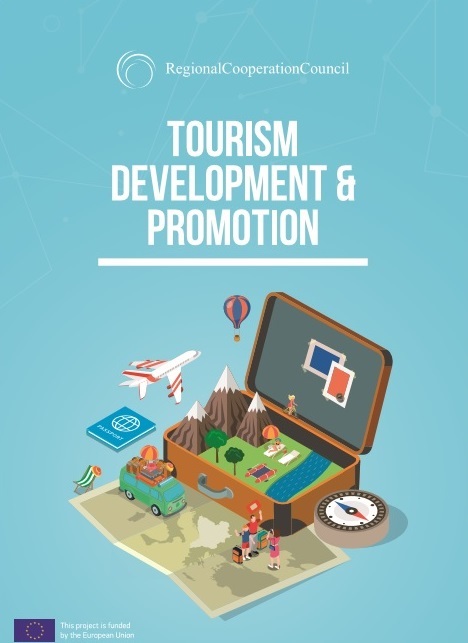 The Regional Cooperation Council (RCC)’s EU-funded Tourism Development and Promotion Project has awarded the first twelve, out of 30 + grants in total value of EUR 548,000. 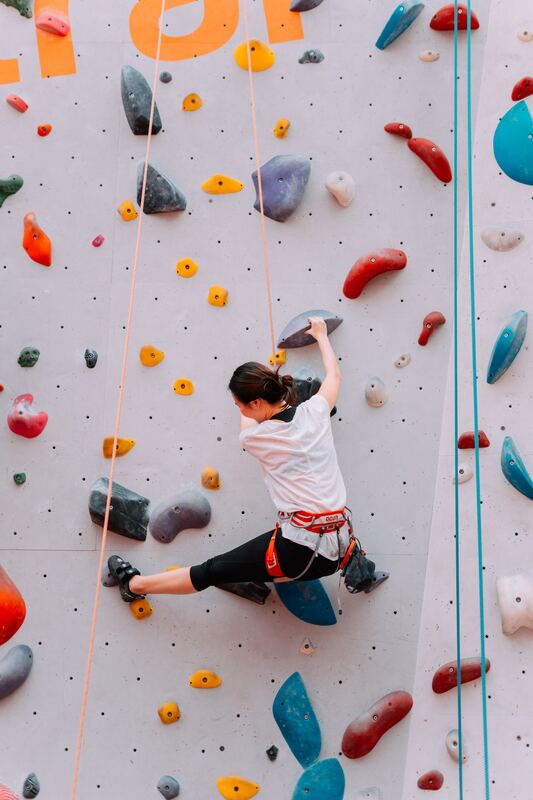 These grants are awarded to the best project proposals received through the public call for proposals looking for ideas intended to improve a joint Western Balkans cultural and adventure tourism offer, as well as infrastructure and quality of services along the selected touristic routes. The Report on the activities of the Regional Cooperation Council (RCC) Secretariat is submitted by the RCC Secretary General to the RCC Board in line with Article 15 of the Statute of the RCC. It covers the period between 15 March – 15 October 2018. The Regional Cooperation Council (RCC) developed a comprehensive Checklist of Corruption Risks in Healthcare Sector with a purpose of strengthening capacities of anti-corruption bodies in identifying and addressing corruption risks in healthcare system. 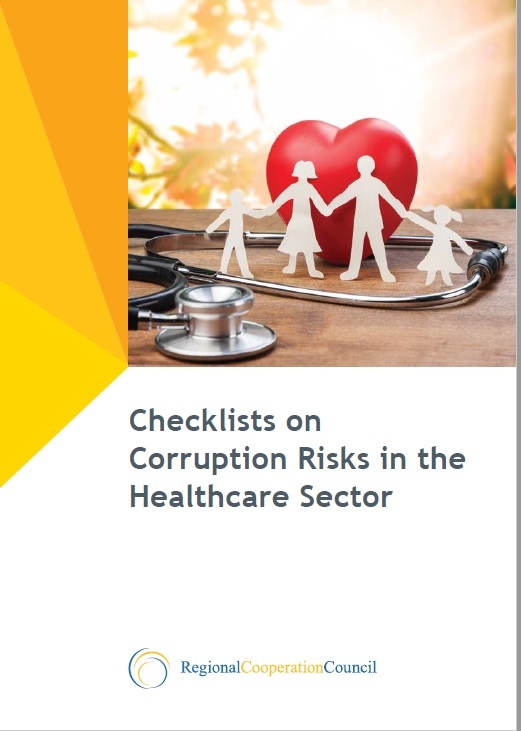 Given the RCC’s Balkan Barometer Public Opinion showing continuous high level concerns of region’s citizens when it comes to corruption, especially in healthcare sector, this checklist reviews whether there are full set of controls in place, in order to minimize the risks for corruption. 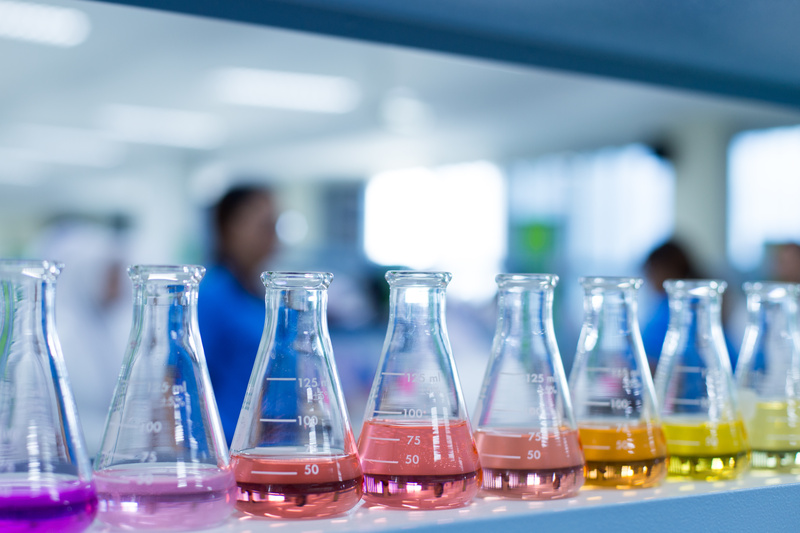 The Initial Statement on the Horizon Europe Proposal represents the initial joint position of Ministries responsible for Science of the Western Balkan Six on the European Commission proposal for Horizon Europe. The preparation of the Statement has been facilitated by the Regional Cooperation Council which was tasked to communicate the Statement to the relevant European Institutions. 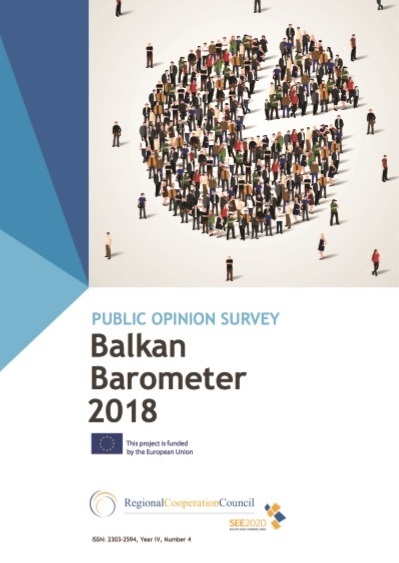 2018 Balkan Barometer is the fourth instalment of the annual public opinion survey commissioned by the Regional Cooperation Council to gather and interpret data spanning a number of thematic areas and topics. The Barometer, as in previous years, examines both the region’s perceptions of today, and its expectations for tomorrow, giving voice to the SEE’s business community as well as its citizens at large. The Western Balkans has returned to the growth path, having added more than 600 THOUSAND JOBS to its economies since 2010 and half a million highly educated people to its workforce. The region expanded its trade by additional EUR 33 BILLION and decreased its trade deficit from -23.1 to -19.7 percent of GDP over the last 7 years through strong export performance, signaling increasing competitiveness of its products and services on the international markets. A comprehensive monitoring effort was introduced to measure the progress of SEE 2020 Strategy's activities implemented and results achieved. This Annual Report on Implementation (ARI) is the main output of the SEE 2020 monitoring process. This 2018 report covers the period from June 2017 to June 2018 and is divided into two main parts: a summary overview of the progress achieved, issues arising and a reflection on some of the lessons learned and overall recommendations for adapting and strengthening the Strategy to meet the challenges of a dynamic political and economic environment in which it operates, and a detailed review per pillar. 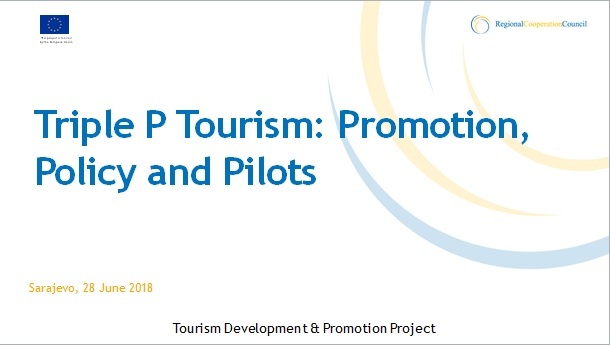 Intervention by Snjezana Derviskadic, Project Leader of the RCC-led Tourism and Development and Promotion Project presented at the project launch in Sarajevo on 28 June 2018. 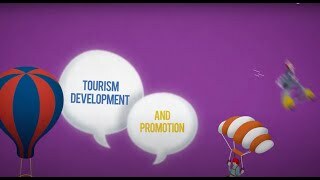 The Regional Cooperation Council’s Tourism Development & Promotion project works to develop and globally promote joint regional tourism routes and offers; improve skills and capacities in tourism industry; remove administrative barriers to tourism development; and increase inflow of tourists and tourism-generated revenues, thus contributing to the overall economic growth of the region. 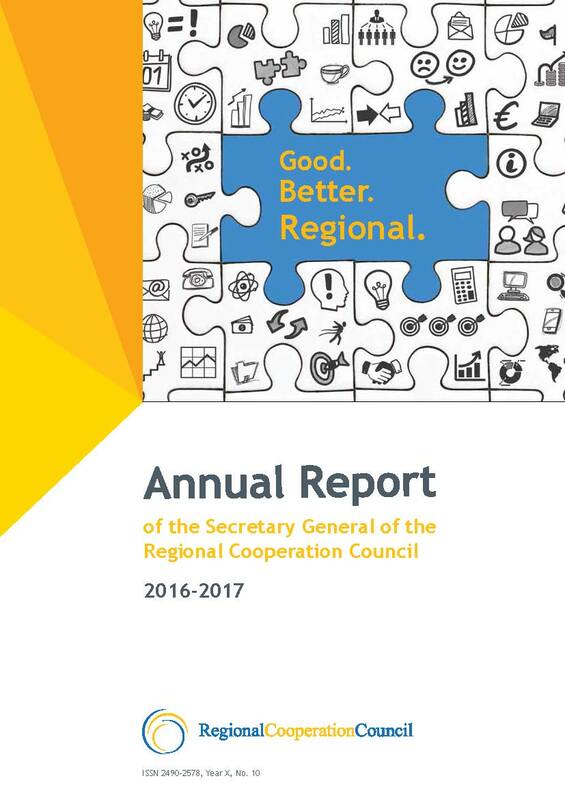 This Annual Report of the Secretary General of the Regional Cooperation Council (RCC) covers the period 1 April 2017 – 15 March 2018. It outlines main RCC activities and achievements in the past year. It also lays out the overall background and crucial developments impacting and shaping the activities of the RCC and the region of South East Europe in the reporting period. The Report on the activities of the Regional Cooperation Council (RCC) Secretariat is submitted by the RCC Secretary General to the RCC Board in line with Article 15 of the Statute of the RCC. It covers the period between 1 September – 31 December 2017 . The RCC South East Europe (SEE) 2020 Strategy Programing Committee adopted the SEE 2020 Programming Document 2018-2020 at its 6th meeting on 12 March 2017 in Brussels. The document sets out the priority actions for the Strategy implementation in the coming period. The sixth meeting of the SEE 2020 Programming Committee was held in Brussels on 12 March 2018 back to back with the Fourth Meeting on Donor Coordination in the Western Balkans. The aim of the meeting was to discuss and potentially endorse the SEE2020 Programming document for the period 2018 – 2020. The meeting gathered representatives of the South East Europe’s (SEE) economies participating in implementation SEE 2020 Strategy, including representatives from the Offices of the National IPA Coordinators (NIPAC Offices), SEE2020 National Coordinators and representatives from the institutions responsible for aid coordination. 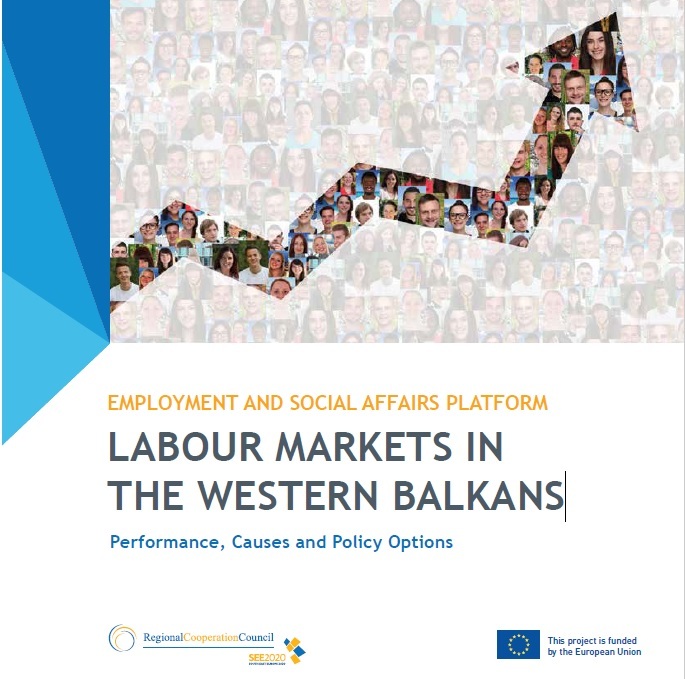 The report is an analysis of trends in the Western Balkan Six labour markets since 2010 and provides recommendations for improving labour markets’ conditions. It focuses on conditions for job creation and factors leading to the employment problems of the region. This is a joint endeavor of researchers from the region and is the first comparative analysis of this kind covering recent years and made available to the regional and international audience in the English language. 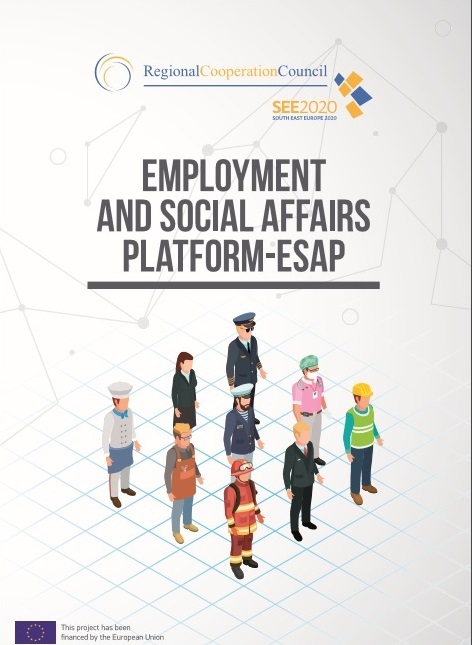 The data presented in this brochure are result of the regional Public Employment Services (PES) benchlearning exercise, which included self-assessment and external assessment in crucial areas and aspects of PES performance fully aligned with the European Union (EU) PES benchlearning model, conducted in 2017 by the Regional Cooperation Council under the Employment and Social Affairs Platform – ESAP in each of the Western Balkans six economies. Regional Cooperation Council (RCC) commissioned a Study on the existing systems of judicial training in the Western Balkans containing deep analysis of judicial training systems in WB6. The Study identifies recent reforms in the field and necessary changes of the regulatory framework. The Study also identifies topics in EU and international law relevant for WB region and proposes RCC’s regional training activities in order to improve cross-border cooperation and competency of WB judiciaries in specific common topics in order to achieve similar level of knowledge in EU law of judges and prosecutors in WB as it is in EU MS. The Study mapes ongoing projects in judicial training in WB, thus enabling better planning, identifying existing results, avoiding overlapping, duplication and non-sustainable activities. 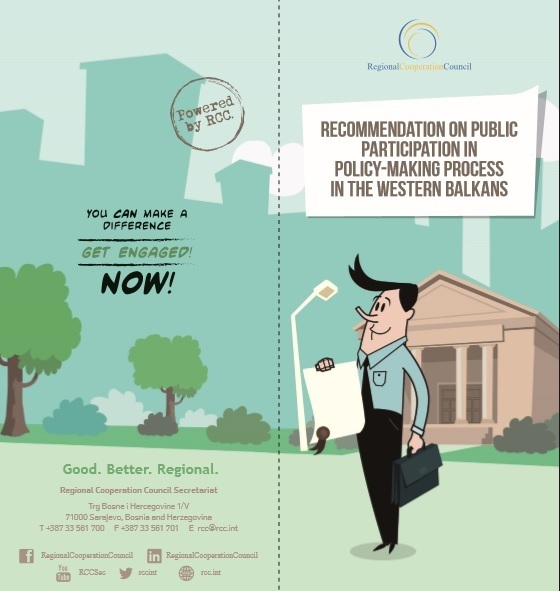 The document represents the draft Guidelines on Governance, Coordination and Reporting for Consolidated Multi-annual Action Plan for a Regional Economic Area (MAP) in the Western Balkans Six. The leaders of Western Balkans Six (WB6) endorsed the Multi-annual Action Plan on a Regional Economic Area in the Western Balkans (MAP), at the Berlin-process summit held on 12 July 2017 in Trieste. 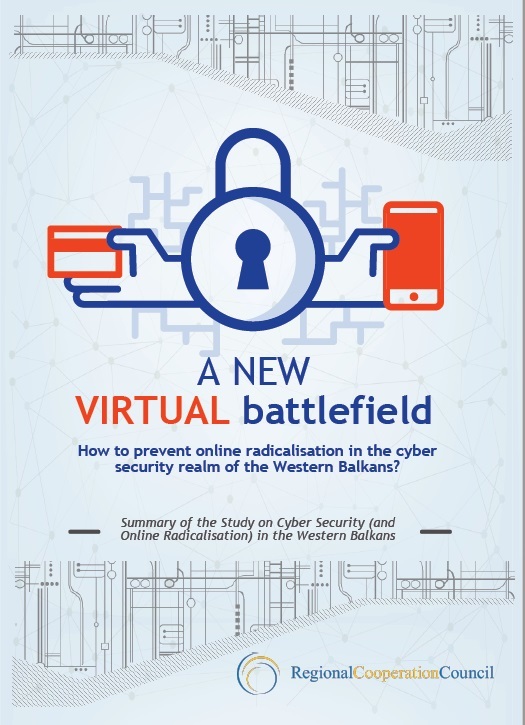 This study, based on a combination of desk research, questionnaires, semi-structured interviews, as well as field visits to the Western Balkans, aims to map the needs and provide an assessment of capacities in the region related to the disengagement, de-radicalization, rehabilitation, and reintegration of former foreign fighters. Western Balkans Recommendation on Public Participation have been endorsed by ministers in charge of public administration reform from Western Balkan economies, at the 8th Governing Board Meeting at Ministerial Level, organised by Regional School of Public Administration (ReSPA), on 6 November 2017 in Tirana. The Recommendations, developed by RCC in partnership with ReSPA, are the result of a joint work with the region's economies based on a need for greater involvement and stronger role of the public and civil society in legislative and decision-making processes. They represent a set of guidelines and rules made to encourage and assist governments to design policies and legislation in an inclusive manner, enabling an active participation of society, including non-governmental organisations, private sector and advisory bodies. 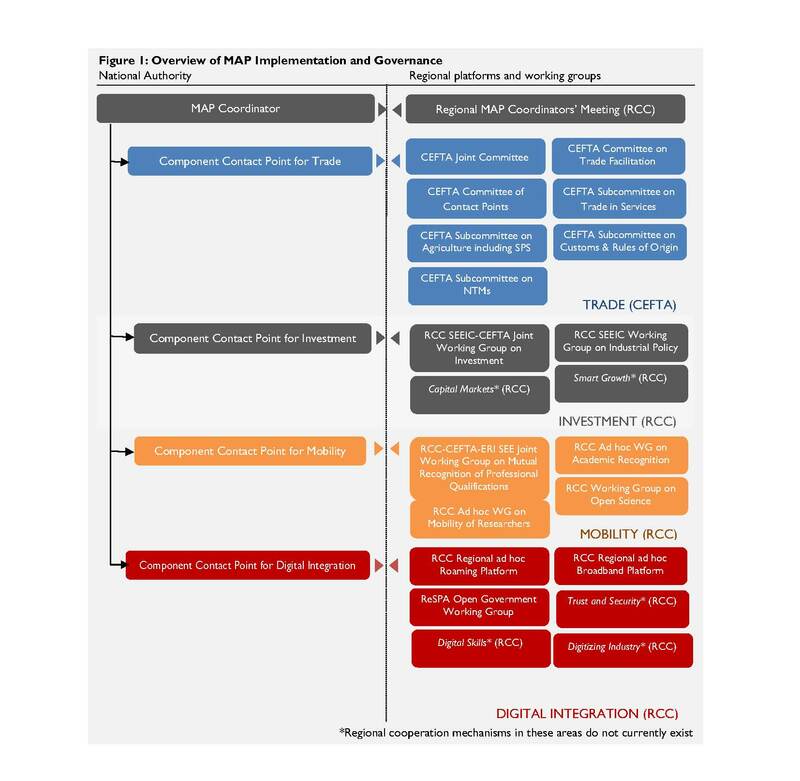 The document represents the operational conclusions of the first Meeting of Multi-annual Action Plan for a Regional Economic Area (MAP) Coordinators and MAP business-to-government (B2G) meeting, held on 31 October 2017, in Brussels. The Report on the activities of the Regional Cooperation Council (RCC) Secretariat is submitted by the RCC Secretary General to the RCC Board in line with Article 15 of the Statute of the RCC. It covers the period between 1 April – 31 August 2017 . 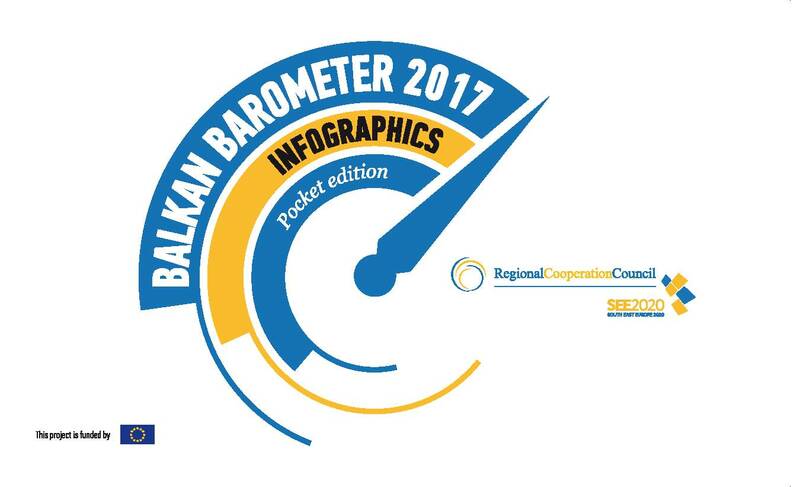 The 2017 edition of BALKAN BAROMETER (BB) is yet another instalment in the series of annual public opinion surveys commissioned by the Regional Cooperation Council. It collects and analyses data across a host of thematic areas, examining aspirations and expectations of the region's populations and its business community on life and work, prevalent socio-economic and political trends as well as regional and European integration, among others. 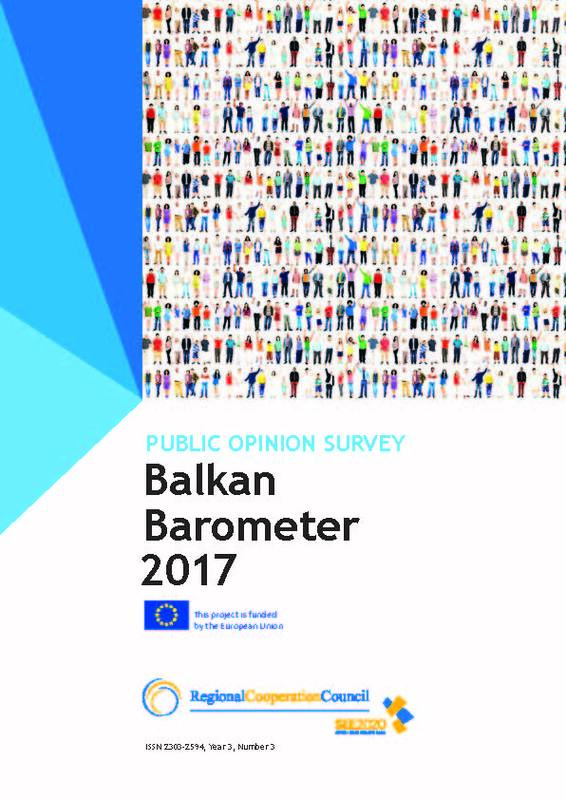 Balkan Barometer Public Opinion Survey conducted by GfK, among 8000 citizens in the course of 2016 throughout our part of Europe, is an easy-to-access source of information. The RCC website www.rcc.int permits download of the publication as well as its datasets which are easily searchable. 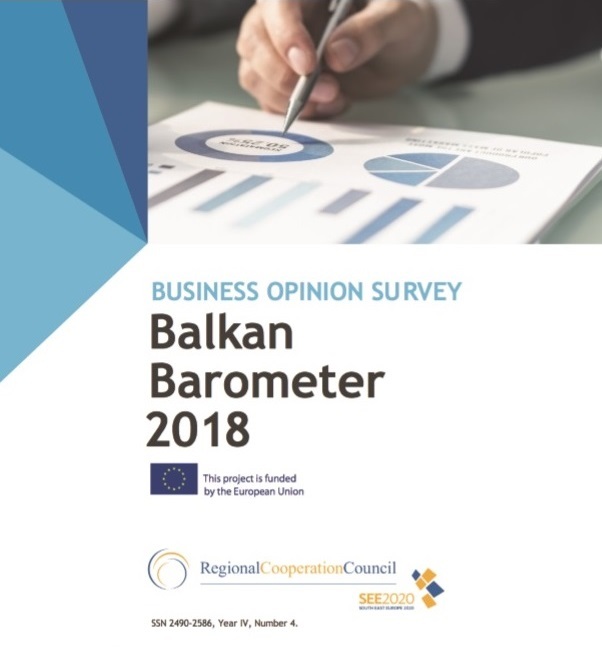 The 2017 edition of BALKAN BAROMETER (BB) is yet another instalment in the series of annual public opinion surveys commissioned by the Regional Cooperation Council. It collects and analyses data across a host of thematic areas, examining aspirations and expectations of the region's populations and its business community on life and work, prevalent socio-economic and political trends as well as regional and European integration, among others. Balkan Barometer Business Opinion Survey conducted by GfK, among 16800 companies in the course of 2016 throughout our part of Europe, is an easy-to-access source of information. The RCC website www.rcc.int permits download of the publication as well as its datasets which are easily searchable. 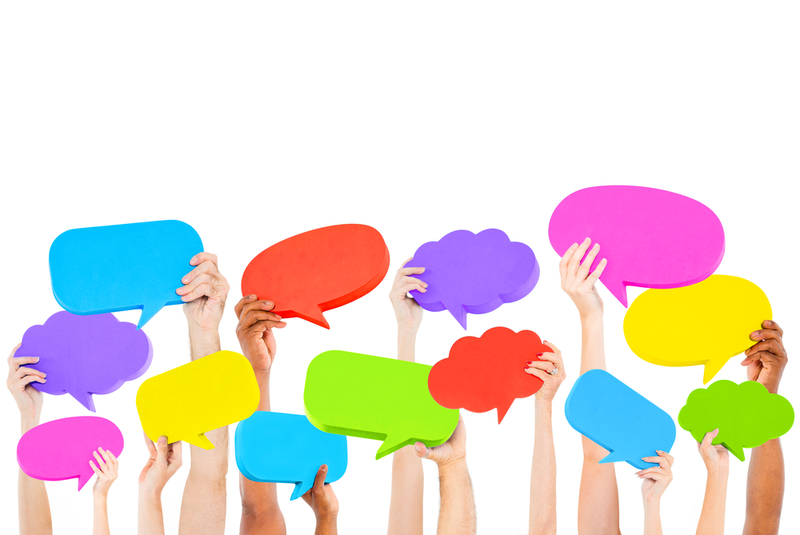 The Recommendations represent a set of guidelines and rules for effective public participation and recommendations for policy-making cycle, including policy formulation, decision-making process, implementation and evaluation. The leaders of Western Balkans Six (WB6) endorsed the Multi-annual Action Plan on a Regional Economic Area in the Western Balkans (MAP), prepared by the RCC, at the Berlin Process summit on 12 July 2017, in Trieste, Italy . The RCC has been tasked to monitor and inform on the progress achieved in MAP implementation. 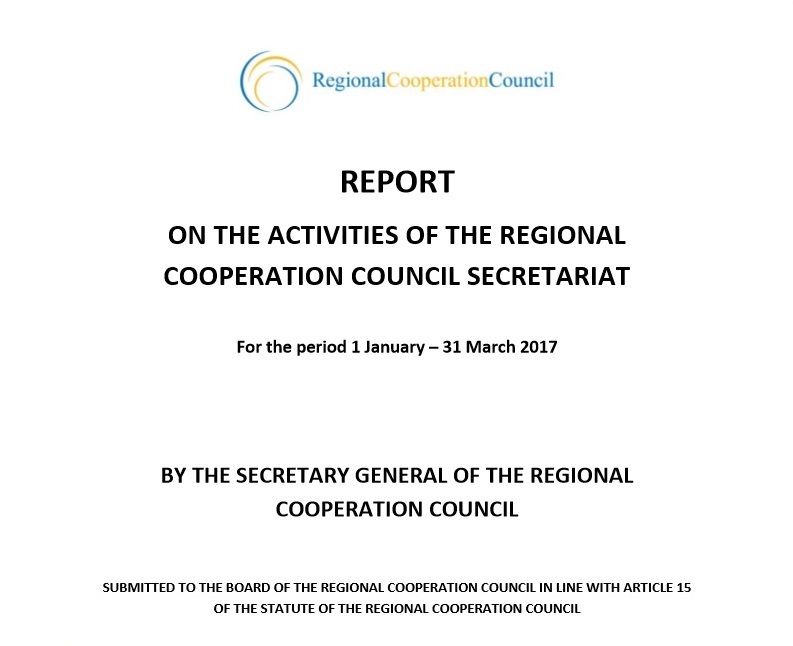 The Annual Report of the Secretary General of the Regional Cooperation Council (RCC) covers the period 1 April 2016 – 31 March 2017. It outlines main RCC activities and achievements in the past year. 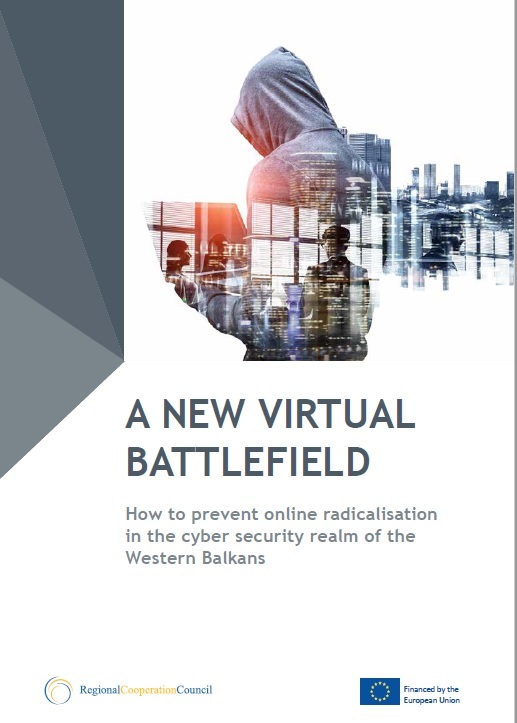 It also lays out the overall background and crucial developments impacting and shaping the activities of the RCC and the region of South East Europe in the reporting period. The report, endorsed at the SEE 2020 Governing Board meeting held on 28 June 2017 in Dubrovnik, Croatia, reflects the status of implementation of the RCC’s SEE 2020 Strategy. This publication shows the most catching results in implementation of the SEE 2020 Strategy until December 2016 through Infographics. 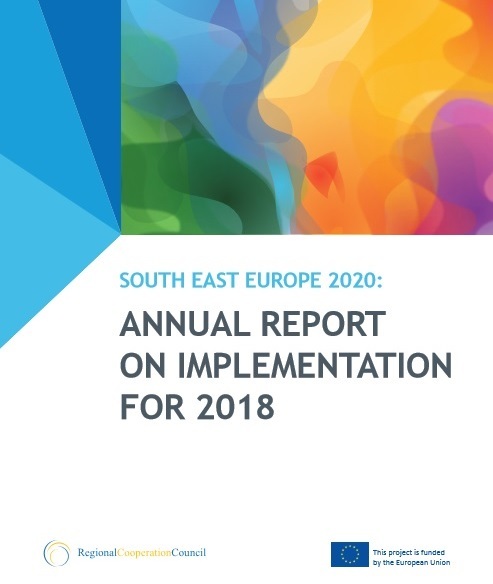 For full information where the SEE is when it comes to implementation of the SEE 2020 strategy, please check the South East Europe 2020: 2017 Annual Report on Implementation. 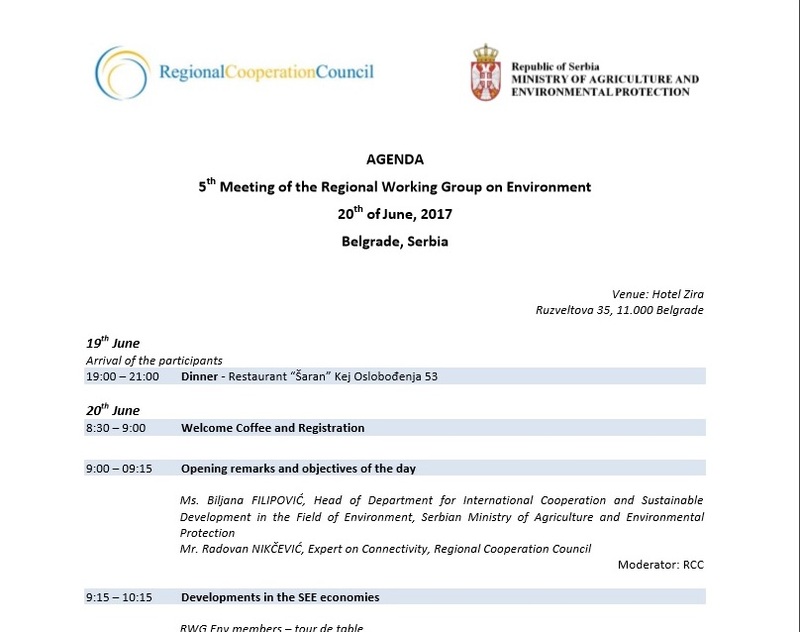 Regional Group on Environment (RWG Env) met for the fifth time in Belgrade to discuss current environmental challenges and actions forward. The Third Meeting on Donor Coordination in the Western Balkans, was held on 16 March 2017, in Sarajevo. 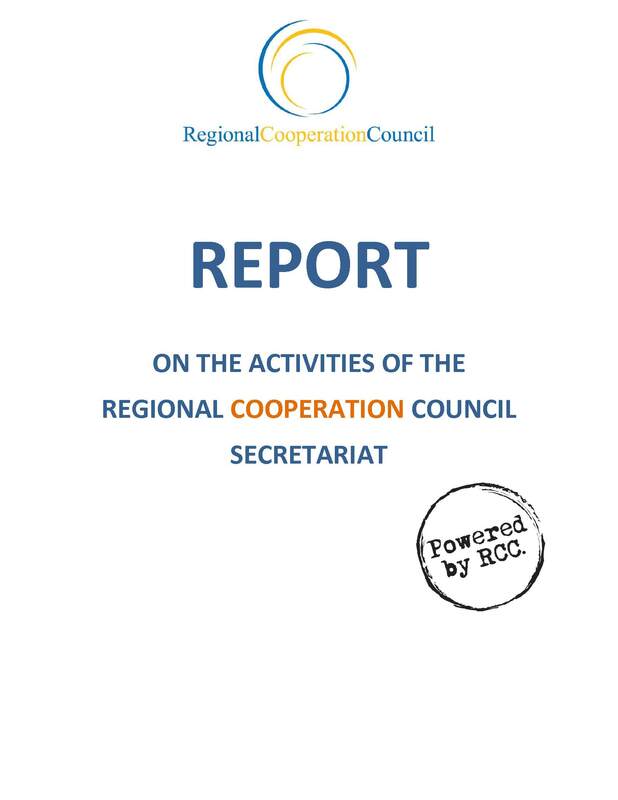 The Report on the activities of the Regional Cooperation Council (RCC) Secretariat is submitted by the RCC Secretary General to the RCC Board in line with Article 15 of the Statute of the RCC. It covers the period between 1 January and 31 March 2017. 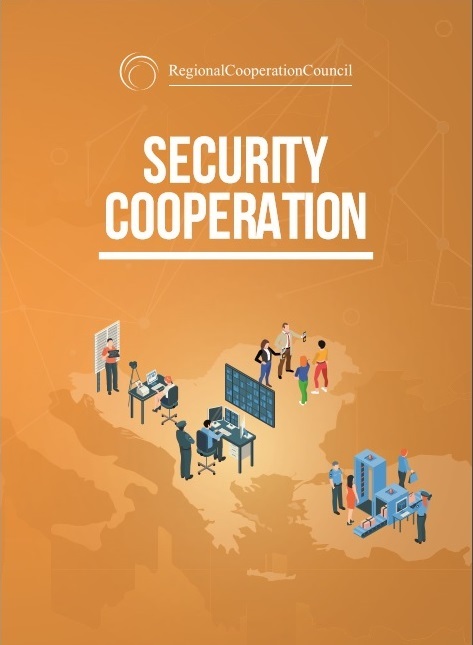 Brochure on Security Cooperation features RCC’s goals, results, and actions of the organization in this area to be taken in the forthcoming period. The Regional Cooperation Council is working towards safe and stable South East Europe, part of the European and wider security architecture, able to take care of its own security and contribute to the security of Europe, supporting European and Euro-Atlantic integration process of the region. 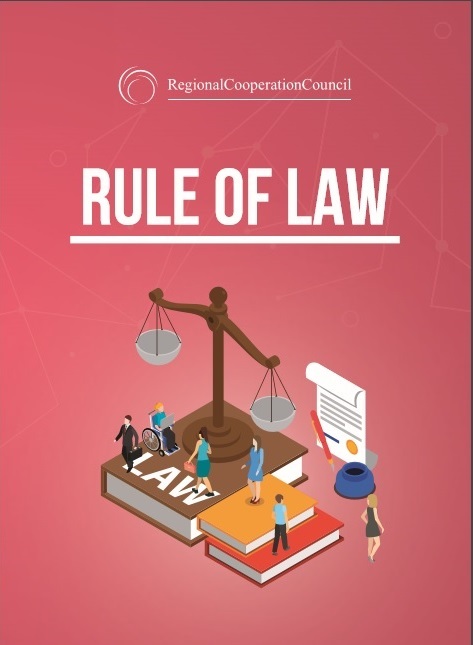 Brochure on Rule of Law features RCC’s goals, results, and actions of the organization in this area to be taken in the forthcoming period. The Regional Cooperation Council is working towards independent and accountable judiciary, and transparent and efficient public services in South East Europe. 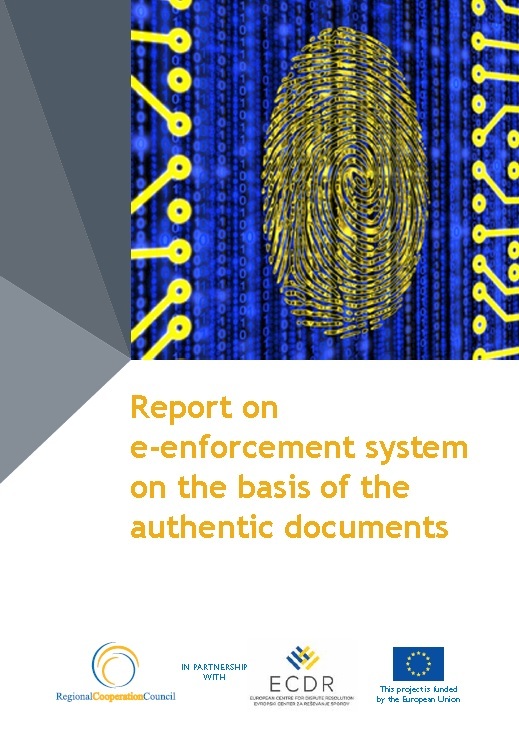 The Report focuses on analysis of the existing systems of judicial e-enforcement based on authentic documents in the Beneficiaries with the ultimate goal of improvements in the field of enforcement in the entire region through legislative, organizational and ICT measures. Brochure on RCC’s flagship ‘Skills and Mobility’, featuring goals, results, and actions of the organization in this area to be taken in the forthcoming period. 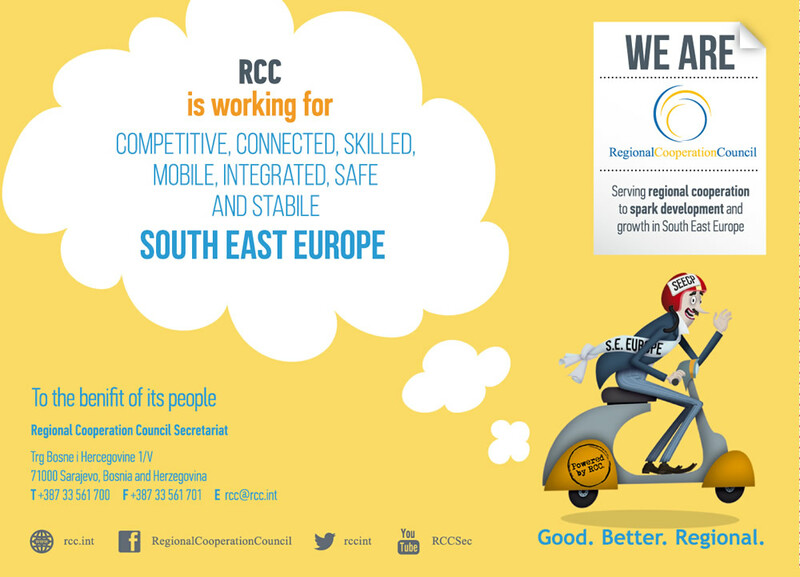 The Regional Cooperation Council is working towards globally competitive base of knowledge and skills in South East Europe; unhindered movement of people, students, researchers and workforce, allowing for increased employment opportunities and creation of new jobs. 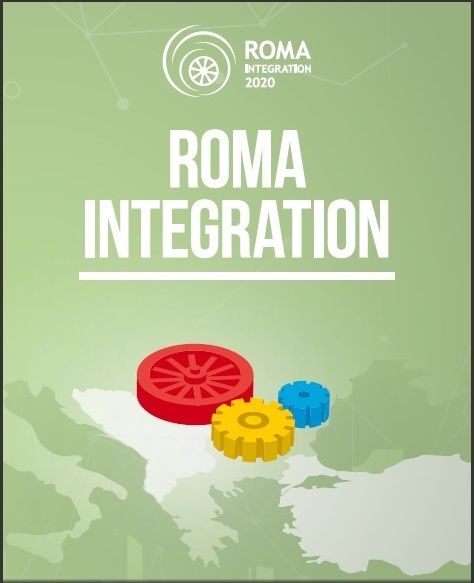 Brochure on RCC’ Project ‘Roma Integration 2020’, featuring goals, results, and actions to be undertaken in the forthcoming period. The Roma Integration 2020 project, implemented by the Regional Cooperation Council (RCC) with the financial support of the European Union and the Open Society Foundations, aims to contribute to reducing the socio-economic gap between the Roma and non-Roma population in the Western Balkans and Turkey and to strengthen the institutional obligations of governments to incorporate and deliver specific Roma integration goals in mainstream policy developments. The RCC South East Europe (SEE) 2020 Strategy Programing Committee adopted the SEE 2020 Programming Document 2017-2019 at its 5th meeting on 15 March 2017 in Sarajevo. The document sets out the priority actions for the Strategy implementation in the coming period. The Report was presented by the RCC Secretary General Goran Svilanovic at the RCC Board meeting held at the RCC Secretariat on 15 March 2017. The report provides an overview of the year 2016, unveils the steps made by the RCC towards strengthening coordination and cooperation on countering radicalization and violent extremism at national and regional levels, under the political umbrella of the SEECP. It puts forward recommendations that may feed into the policy making process, addressing radicalization and violent extremism in SEE in both short and medium term. Brochure on RCC’s flagship ‘Connectivity’, featuring goals, results, and actions of the organization in this area to be taken in the forthcoming period. 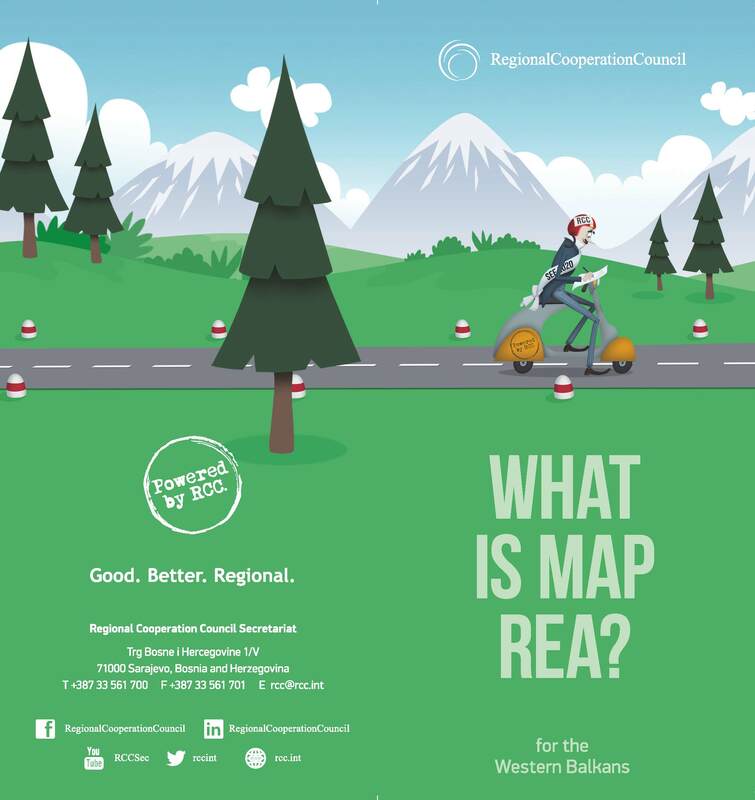 The Regional Cooperation Council is working towards better connected South East Europe, integrated in the EU transport, energy and digital networks and an active contributor to the relevant EU policies. 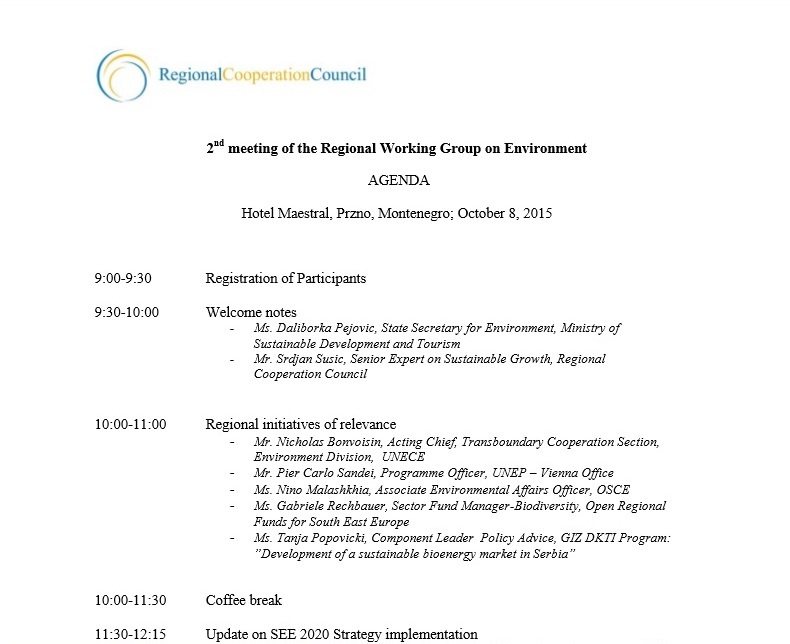 Regional Working Group on Environment met in Belgrade for its fourth meeting. RCC Deputy Secretary General's presentation at NATO's 93rd Rose-Roth Seminar held in Pristina, 22-24 October 2016. RCC Deputy Secretary General Gazmend Turdiu spoke about the RCC activities, achievements of the SEE 2020 Strategy and the need and challenges of the economic growth in Western Balkans at "An Agenda for Regional Growth" session within NOTO's Rose-Roth seminar. 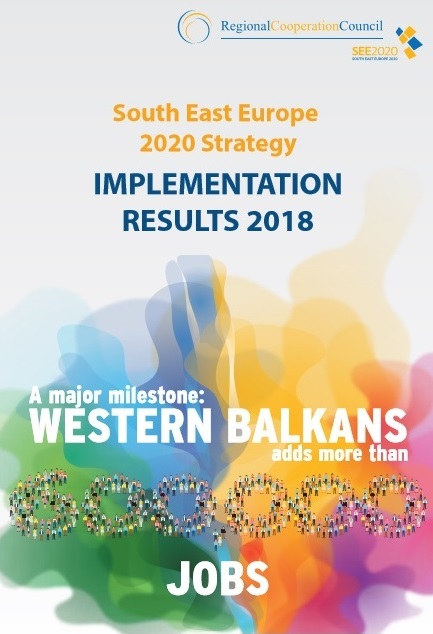 Europeanwesternbalkans.com published an article by Sanjin Arifagic, RCC's Coordinator of South East Europe (SEE) 2020 Strategy, on the Strategy’s implantation. The topic of violent extremism has increasingly become a part of policy discussions among domestic officials, international actors, academic researchers and civic activists in South East Europe over the past several years. 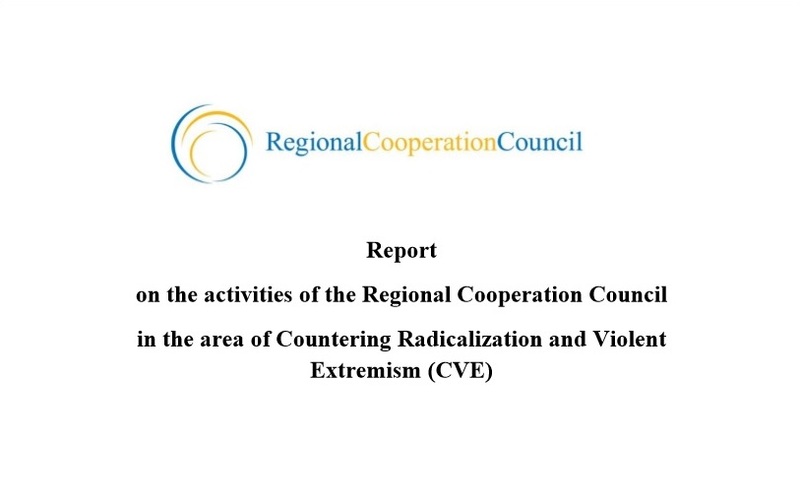 This study, commissioned by the Regional Cooperation Council (RCC), is aimed at better understanding of the situation regarding violent extremism, and related planned and on-going governmental and non-governmental activities in preventing and countering radicalization and violent extremism leading to terrorism in SEE (Albania, Bosnia and Herzegovina, Kosovo*, Montenegro, Serbia, The Former Yugoslav Republic of Macedonia and Turkey). 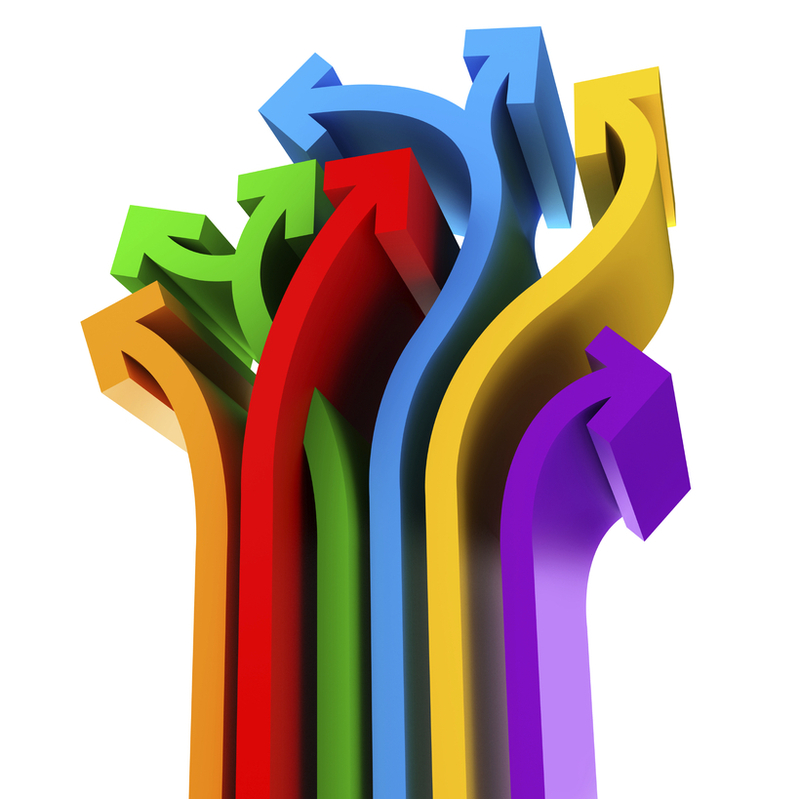 The research also aims to identify gaps and unnecessary overlap, and contains conclusions and recommendations. 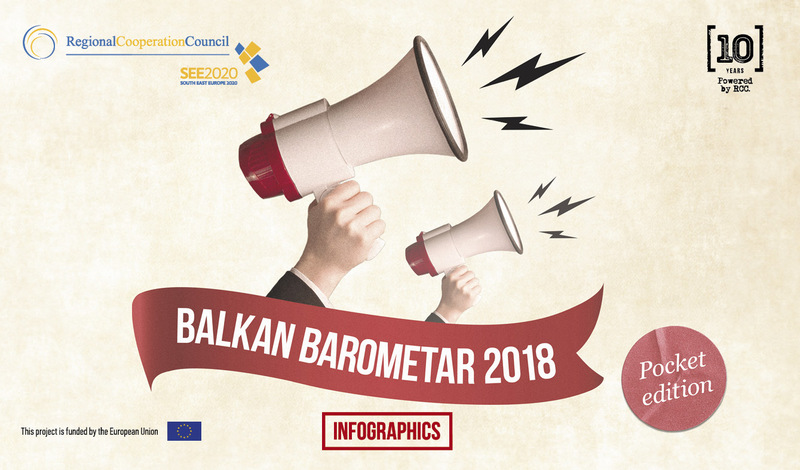 The Balkan Barometer, published for the first time in 2015, surveys 7,000 citizens and 1,400 businesses in seven SEE economies, on a wide range of issues dealing with the political, socio-economic, business and investment climate, infrastructure, rule of law and other developments in the region. This year’s survey also includes select information on Moldova and Slovenia, giving a wider overview of the South East European region. 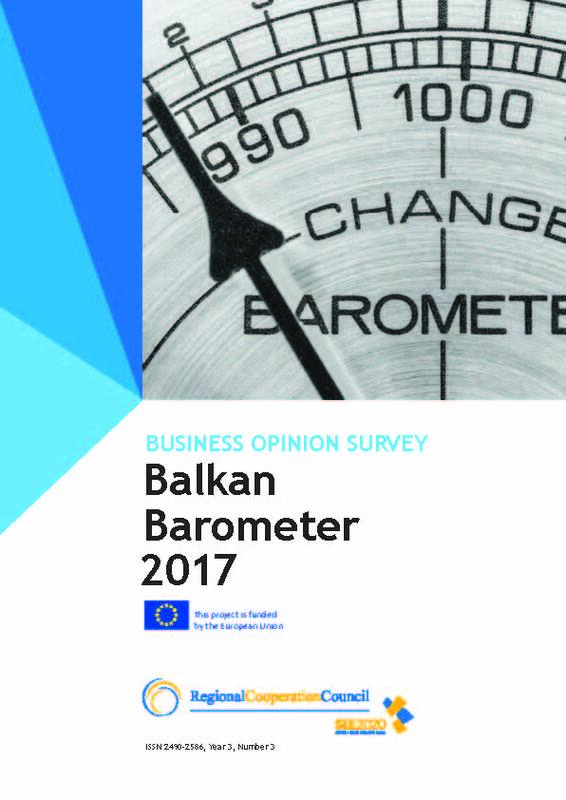 The Balkan Barometer 2016 is published in two volumes: The Public Opinion Survey, detailing the citizens’ attitudes, and the Business Opinion Survey, summarizing the business sentiments. The research and publications have been prepared and developed in cooperation between the RCC and the GfK, one of the world’s largest market research institutes. 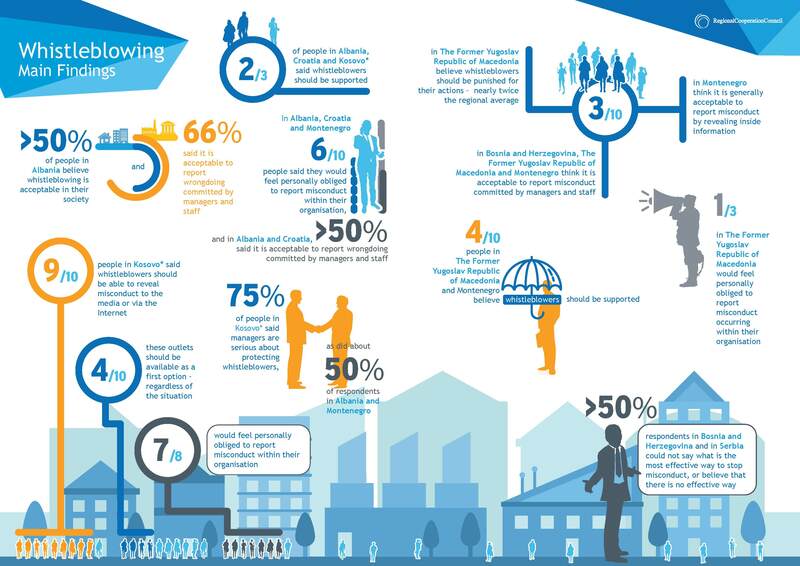 This infographic represents the main findings of the RCC’s Balkan Barometer 2016. 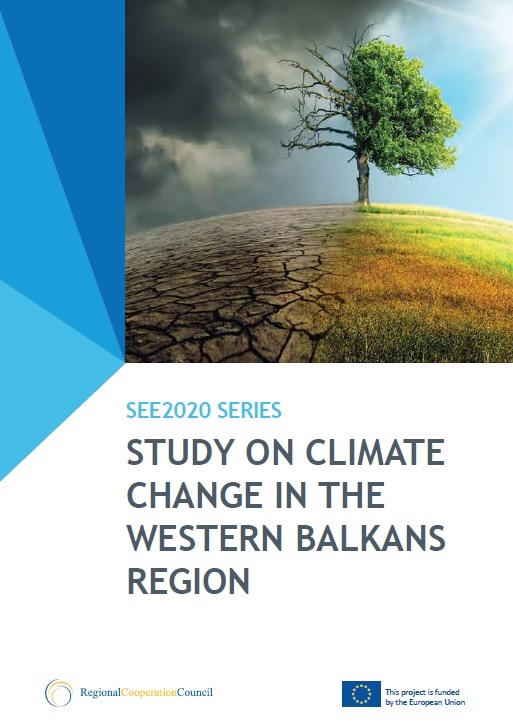 The report, presented at the SEE 2020 Governing Board meeting held on 30 May 2016 in Pravets, Bulgaria, reflects the status of implementation of the RCC’s SEE 2020 Strategy. 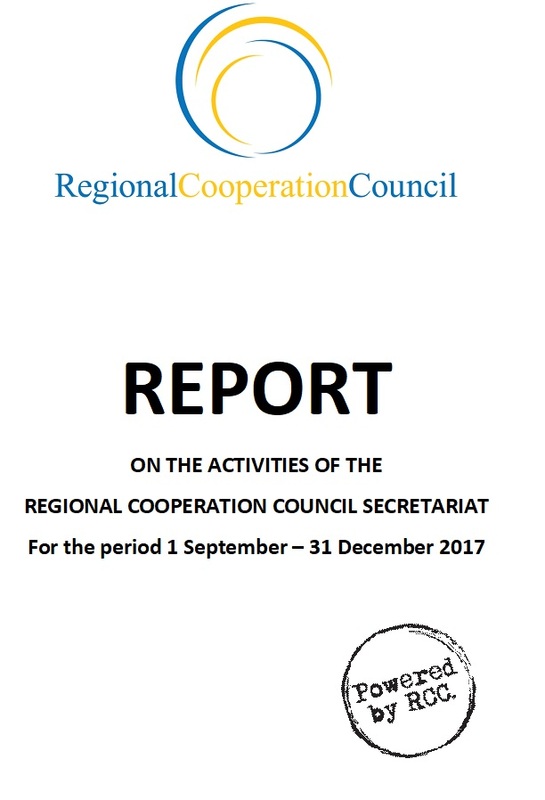 The Annual Report of the Secretary General of the Regional Cooperation Council (RCC) covers the period 1 April 2015 – 31 March 2016. It outlines main RCC activities and achievements in the past year. It also lays out the overall background and crucial developments impacting and shaping the activities of the RCC and the region of South East Europe in the reporting period. 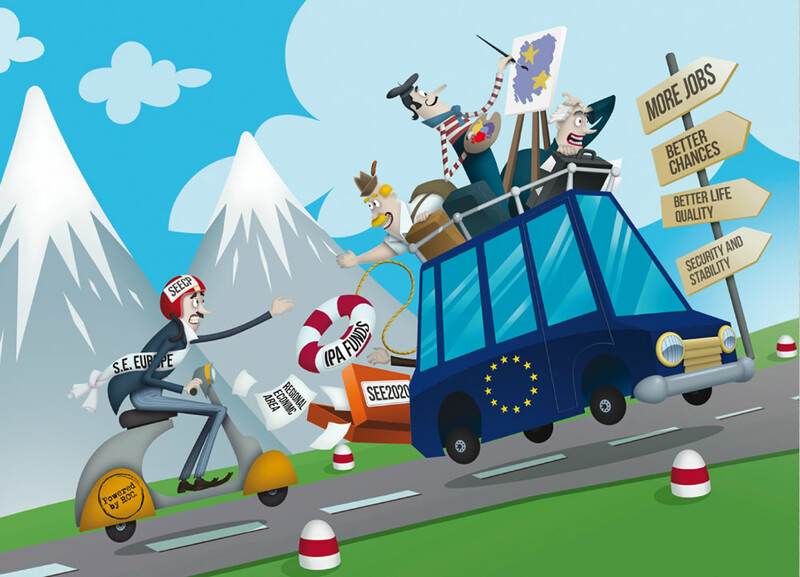 The Report provides recommendations on how to achieve steady progress in the upcoming period in Policy areas Migration Management and the Fight against Serious and Organised Crime via the streamlining of Regional Cooperation and establishment of a coherent policy implementation process directed toward the fulfilment of Chapter 24 requirements and efficient countering of current and occurring threats to regional and European values. 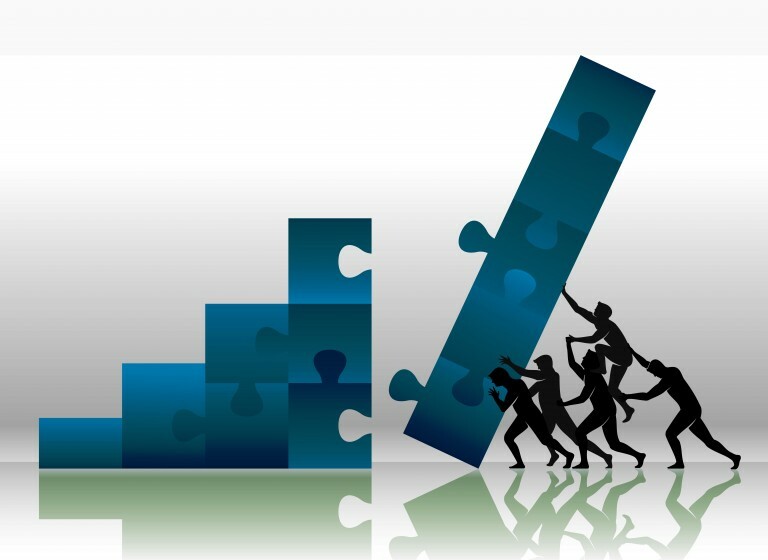 The purpose of the RCC Project is to contribute to a steady and consistent progress on part of the Beneficiaries in the upcoming period 2014-2020 in the fulfilment of Chapter 24 requirements regarding Migration Management and the Fight against Serious and Organised Crime, and raising their capacities for addressing current and occurring regional security threats via an optimal use of existing Regional Cooperation efforts and a rational use of national and donors’ resources. This is addressed through acquiring a comprehensive picture of national priorities and needs that have to be tackled on part of the Beneficiaries in the upcoming period, identifying positive areas of action in Regional Cooperation, and examining potential solutions – including whether a greater effect and added value would be achieved if they should be addressed at national or regional level. 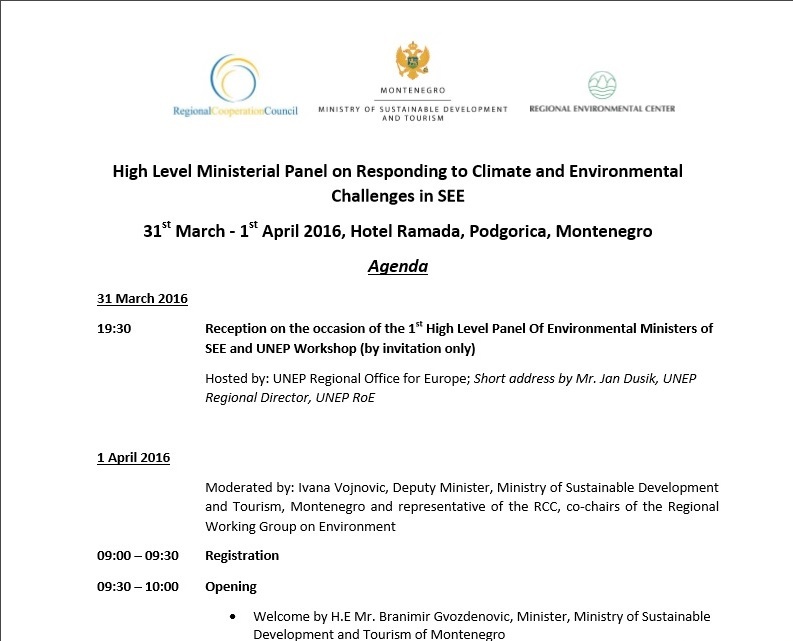 The First High Level Ministerial Panel on Responding to Climate and Environmental Challenges in South East Europe (SEE) took place in Podgorica, Montenegro. 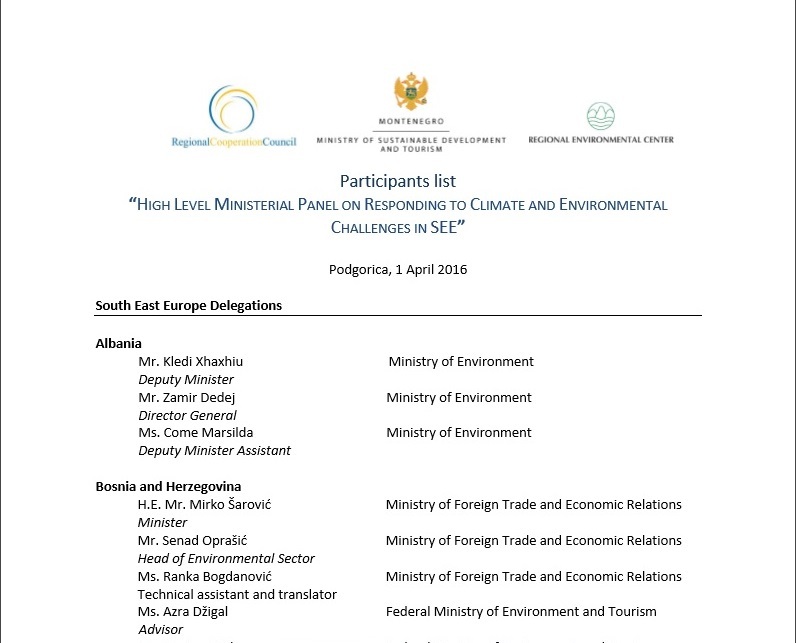 The Declaration has been adopted at the First High Level Ministerial Panel on Responding to Climate and Environmental Challenges in South East Europe (SEE) that took place on 1 April 2016 in Podgorica, at the event co-organized by the Regional Cooperation Council, Ministry of Sustainable Development and Tourism of Montenegro, and the Regional Environmental Center, together with partner organisations: UNEP, Global Water Partnership Mediterranean, Umweltbundesamt - the Environment Agency of Austria, the South Eastern Europe Regional Rural Development Standing Working Group, the International Union for Conservation of Nature, the Deutsche Gesellschaft für Internationale Zusammenarbeit (GIZ), and SEE Change Net. In this Report the information on the delay reduction policies undertaken by the six Beneficiaries involved in the project is considered in the wider European context. The policies highlighted in the Beneficiaries are compared with the most interesting policies and effective practices carried out by the select European countries to improve the pace of litigation. 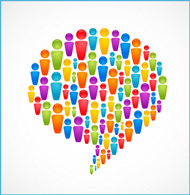 Even though it is not possible to design a one-size-fits-all model to reduce case backlogs that could be used by all the courts, some quite specific policies and practices that have been proven to be effective in several participants can be singled out and adapted for consideration by the Beneficiaries. Thus, the report proposes a concrete programme of actions with different options that could be implemented in the judiciaries of the Beneficiaries, based on the policies and practices of the European examples described here. The literature review complements the statistical data, responses to the questionnaire and interviews with the Beneficiaries, and they together provide a basis for a concrete plan of backlog reduction for the Beneficiaries. The Report has been approved by the WB Working Group on Justice. 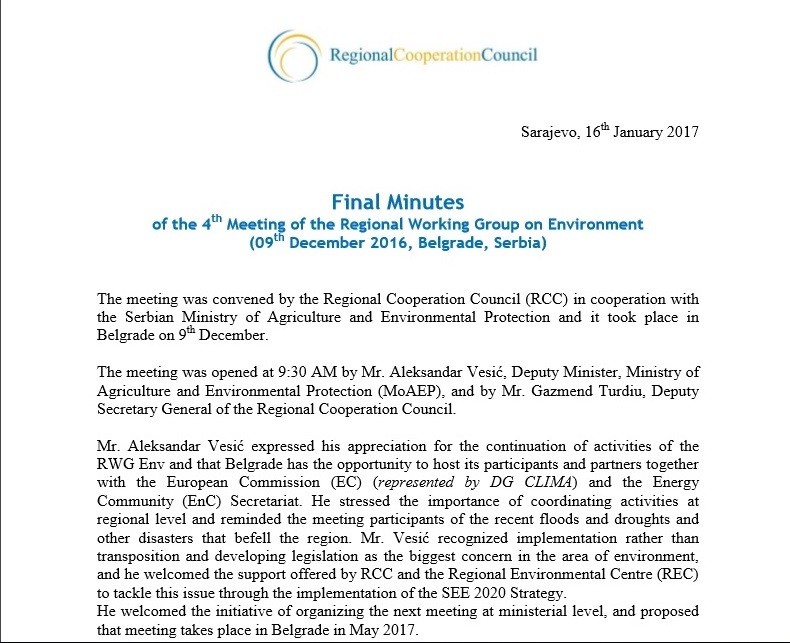 The Report was presented by the RCC Secretary General Goran Svilanovic at the 28th RCC Board meeting held at the RCC Secretariat on 26 February 2016. Regional Cooperation Council gathered regional media representatives at the Regional Cooperation Day held in Sarajevo on 18-19th December 2015 to discuss the most pressing issues on the regional media landscape. Regional Cooperation Council (RCC) and representatives of the regional Civil Society Organisations, who mainly came from think-tanks, gathered in Sarajevo on 18-19th December 2015 at the Regional Cooperation Day to discuss the impact of CS organizations on EU integration process on the national and regional level. This study represents a proposal for strengthening and deepening the economic relations between South East Europe and Turkey, by providing comprehensive diagnostics of SEE’s and Turkey’s economies, complementarities between their businesses, as well as defining key strategic policy areas in which they can work together. 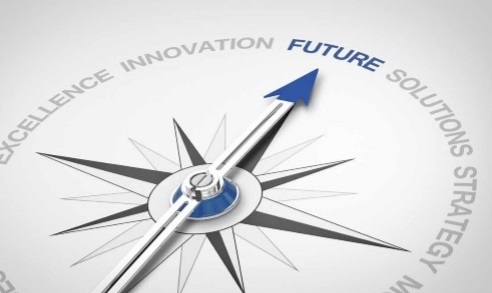 It recommends and proposes specific project ideas which could serve as an inspiration for the public and private sectors of the SEE end Turkey, particularly in sourcing domestic business opportunities through investments and trade in targeted sectors; integration into global chains and opening opportunities in third markets. The RCC has teamed up with the Union of Chambers and Commodity Exchanges of Turkey (TOBB) and the Economic Policy Research foundation of Turkey (TEPAV) to prepare and publish this study. Europe's World, independent Europe-wide policy journal, published in its Autumn issue an article by Secretary General of the Regional Cooperation Council, Goran Svilanovic, on EU enlargement. The purpose of this paper is to provide Southeast European (SEE) economies with different options, integrated framework and practical advices to conduct tailored corruption risk assessment(s) efficiently and comprehensively, and consequently improve or upgrade governance / management of public sector institutions on integrity grounds. The paper is based on international best practices, theory and research, as well as the personal experience of author who was in the period 2011 - 2013 involved in the implementation of new system of integrity plans in Republic of Slovenia. At the Regional Conference on Corruption Risk Assessment, Public Procurement, and Open Contracting in South Eastern Europe, that took place on 26 – 27 May, 2015 in Istanbul, Turkey, 10 Principles on Effective Corruption Risk Assessment in Public Administration were endorsed. The event was organized by United Nations Development Program (UNDP), in cooperation with Regional Cooperation Council (RCC) and Regional Anti-Corruption Initiative (RAI) and co-funded by the Swiss Agency for Development and Cooperation (SDC). 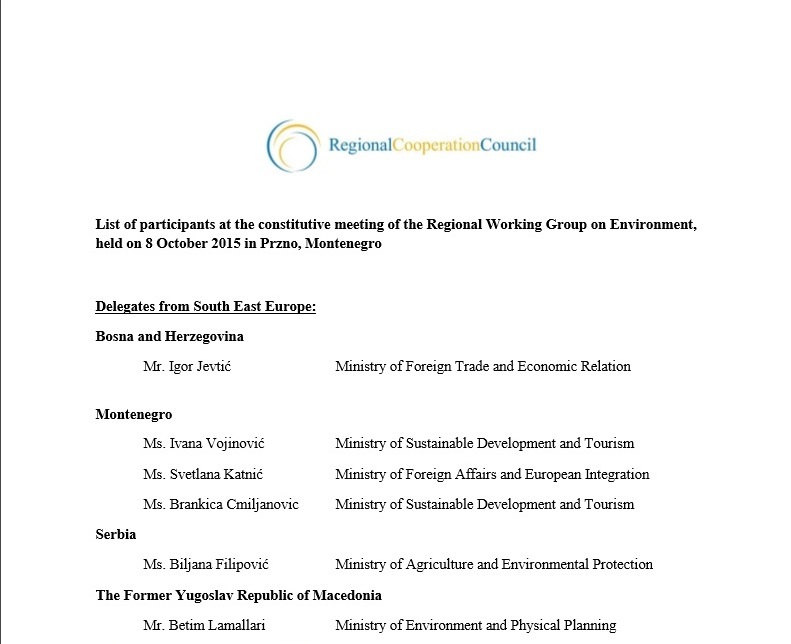 The second meeting of the Regional Working Group on Environment was convened by the Regional Cooperation Council (RCC) and the Ministry of Sustainable Development and Tourism of Montenegro. Montenegrin daily Vijesti published on 11 September 2015, an article by the Secretary General of the Regional Cooperation Council (RCC), Goran Svilanovic, on the recently held event in Ankara on connecting South East Europe businesses, co-organized by the RCC as a part of the B20 meeting of business people from G20 countries, which served as preparation for the next summit of the 20 most developed world economies. In an interview for Radio Free Europe, Goran Svilanovic, Secretary General of the Regional Cooperation Council, spoke about the current refugee crisis, described as the largest since the World War II. Anti-corruption assessment of laws aims at closing entry points for corruption contained in any legislation. For example, a badly regulated procedure for obtaining a building permit can make it easy for public officials to extort bribes from citizens. Once corruption proofing becomes an established practice, it will make legal drafters think ahead what corruption risks the legislation might facilitate in the future and how these risks can be avoided from the very beginning of the drafting process. The publication was developed by the Regional Anti-corruption Initiative and the Regional Cooperation Council, in cooperation with Dr. Tilman Hoppe. It shows that 13 countries in the world have a method in place for reviewing whether their general legislation contains any corruption risks. The added value of the publication lies in the Methodology it suggests. 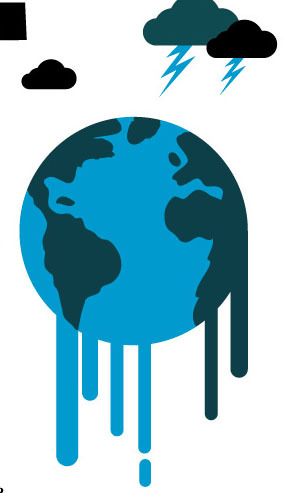 The Methodology compiles all best practices internationally available and describes an ideal corruption proofing process, the framework for implementing it, as well as all typical regulatory corruption risks. It is written as an easy to understand manual, which any reader will be able to work with, including civil society stakeholders, which are new to this tool. On 13 – 14 November, 2014, the Regional Anti-corruption Initiative (RAI), the Regional Cooperation Council (RCC), the Ministry of State on Local Issues of Albania and the Southeast Leadership for Development and Integrity (SELDI) co-organized the Regional Conference on Good Governance and Anti-corruption Policy Challenges. The Conference recommended for use the Methodology on Anti-corruption Risk Assessment of Laws developed by RAI and RCC, and adopted the 10 Ten Principles of Effective Corruption Proofing as an international standard in this field and recommended corruption risk assessment as a corruption preventive tool. In the interview the RCC Secretary General speaks about bilateral issues in the region, political situation in SEE, RCC Balkan Barometer, Balkans EU aspirations, investment opportunities and common market, as well as about RCC’s activities in boosting economic development of the region and regional cooperation in general. 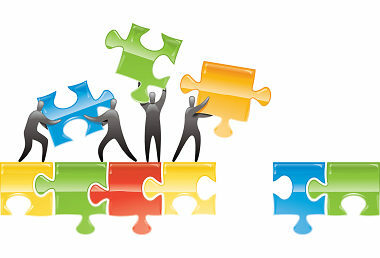 The purpose of the establishment of a Working Group of the high level representatives of ministries of justice is to assist in the implementation of the SEE 2020 – Jobs and Prosperity in European Perspective, particularly in the area of justice under the Governance for Growth Pillar of the Strategy. For this purpose, the Working Group will operate under the auspices of Regional Cooperation Council (RCC) Secretariat with the programming, implementation, reporting and monitoring on the activities within Justice Dimension. Interview with Goran Svilanovic, RCC Secretary General : “I am an optimist because of Western Balkan's strong desire to be a part of the EU family of nations"
RCC Secretary General, Goran Svilanovic, on achievements and future plans of the Secretariat. 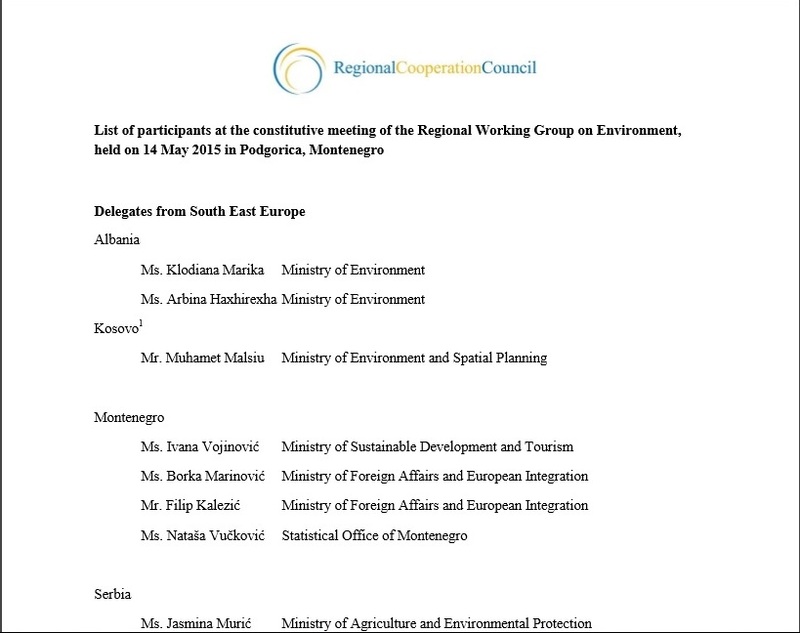 Regional Working Group on Environment under the South East Europe 2020 Strategy adopts the Rules of Procedure, prescribing its mode of operation, roles and responsibilities, composition, business conduct, procedures, etc. 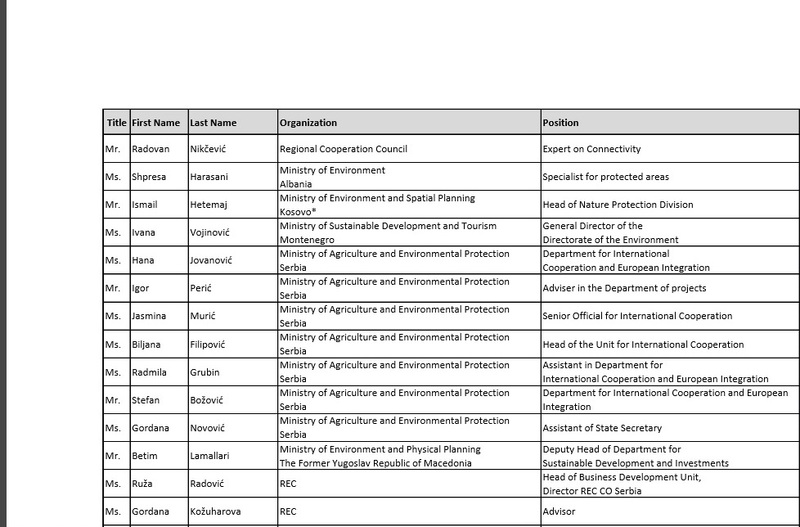 The purpose of the establishment of the Regional Working Group of high-level representatives of ministries responsible for environment, water resources, land, energy and climate change (hereinafter referred to as: “Regional Working Group” or “RWGE Env”) is to guide the implementation of the Dimension J - Environment of the SEE 2020 Strategy – Jobs and Prosperity in European Perspective (hereinafter referred to as: SEE 2020 or Strategy). RWG Env will operate under the auspices of Regional Cooperation Council (RCC) Secretariat with the main responsibility for programming, overseeing, and monitoring the activities within Dimension Environment. 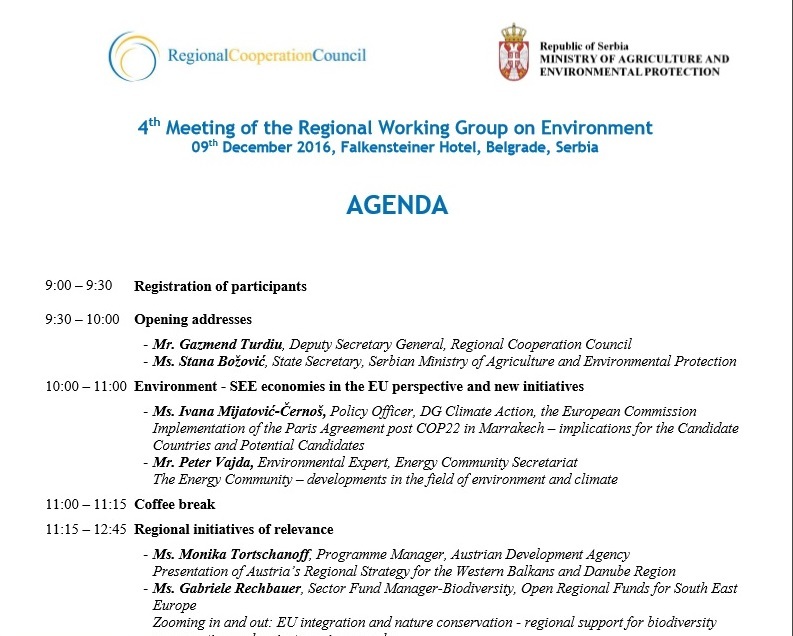 The first, constitutive meeting of the Regional Working Group on Environment was held in Podgorica under the auspices of the Regional Cooperation Council (RCC). The report covers the period April 2014-March 2015 and outlines main RCC activities and achievements in the past year. It also lays out the overall background and crucial developments impacting and shaping the activities of the RCC and the region of South East Europe in the reporting period. The report presents the results of the RCC-commissioned survey of public opinion of SEE citizens on crucial economic and development issues, intended to engage more closely the general public in context of the RCC’s SEE 2020 Strategy. The survey was carried out in December 2014 by GfK, and was conducted face to face with 7000 respondents, in all seven economies covered by the Strategy. 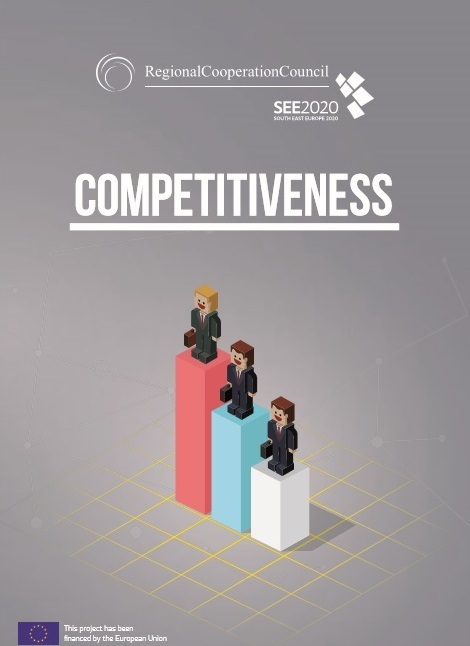 The report presents the results of the RCC-commissioned survey of business sentiment in SEE on crucial economic and development issues, intended to engage more closely the business community in context of the RCC’s SEE 2020 Strategy. The survey was carried out in December 2014 by GfK, and was conducted face to face with 1400 companies of different size and different business areas, which are not majority-owned by the state or government, in all seven economies covered by the Strategy. The event, co-organised by the Council of Ministers of Bosnia and Herzegovina, the Regional Cooperation Council and Foreign Investors Councils of the region, took place on 28 April 2015, in Sarajevo, BiH. In the interview the RCC Secretary General speaks about the EU prospects of the region. In the interview the RCC Secretary General speaks about the current momentum in the region, explains why he thinks BiH will make significant steps forward in 2015, presents the SEE 2020 Strategy for employment, and explains why he brings Nusic’s play ‘Gospodja Ministarka’ to the citizens of Sarajevo. The report covers the period April 2013-April 2014 and outlines main RCC activities and achievements in the past year. It also lays out the overall background and crucial developments impacting and shaping the activities of the RCC and the region of South East Europe in the reporting period. The report, presented today at the First SEE 2020 Governing Board meeting, reflects the intensive work on implementation of the RCC’s SEE 2020 Strategy, as integral part of the RCC SWP 2014 – 2016, carried out during the past months, coordinated by the RCC Secretariat. In the interview the RCC Secretary General speaks about the RCC’s activities and their focus on economy issues. In the interview, the RCC expert speaks about the RCC’s activities in the area of air transport in South East Europe, through the organisation’s South East Europe 2020 Strategy. In the interview the RCC Expert on Integrated Growth, Dragana Djurica, speaks about the issues women entrepreneurs face, the way to tackle them and motivate women to do business in larger numbers, as well as about the RCC's overall development Strategy for the region – South East Europe 2020. In the interview the RCC Secretary General is speaking about the RCC’s SEE 2020 Strategy, organisation's priorities, economic situation in SEE and regional cooperation. The address was delivered at a two-day workshop with Western Balkan journalists, devoted to Regional Cooperation Council (RCC)’s South East Europe (SEE) 2020 strategy, in Sarajevo, BiH, on 18-19 March 2014. The speech was delivered at the event marking the completion of project Improving Cooperation in South-East Europe by Actions for Strengthening the Regional Cooperation Council (RCC), organised by CEI and the RCC Secretariat. In the interview the RCC Secretary General speaks about the new approach of the European Union towards the countries in the region, RCC’s South East Europe (SEE) 2020 strategy, and social protests. The article was published on the occasion of Regional Cooperation Council (RCC)'s sixth anniversary, on 27 February 2014. 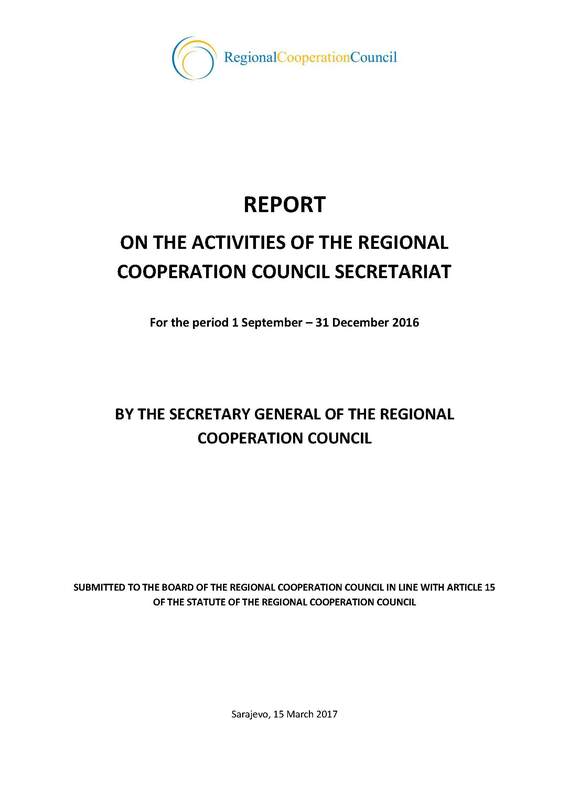 The report covers the period from 1 October to 31 December 2013. The author article by the RCC Secretary General, has been published by 9 dailies from the region: in Politika (Serbia, published on 24 January 2014); Dnevni avaz, Nezavisne novine and Vecernji list (Bosnia and Herzegovina, published on 22 January 2014); Vijesti (Montenegro, published on 20 January 2014); Mapo (Albania, published on 17 January 2014); Jutarnji list (Croatia, published on 17 January 2014); Utrinski vesnik (The Former Yugoslav Republic of Macedonia, published on 17 January 2014); and Tribuna (Kosovo*, published on 16 January 2014). The articles, including all translations to English are available at the language links below. Media professionals, practicing media lawyers, legislators/parliamentarians, government officials, members of media regulatory and self-regulatory bodies, civil society and academia from South East Europe dealing with media freedom issues gathered for the 2nd edition of the Academy in Sarajevo, Bosnia and Herzegovina, on 2-5 September 2013, to discuss solutions to common challenges in media policy and regulation in the region. 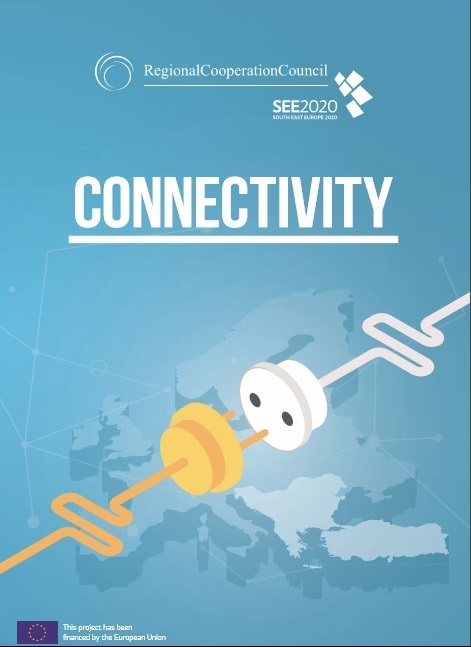 The goal of the South East Europe (SEE) 2020 strategy of the Regional Cooperation Council (RCC), is to improve living conditions in the region and bring competitiveness and development back in focus, closely following the vision of the EU strategy Europe 2020. 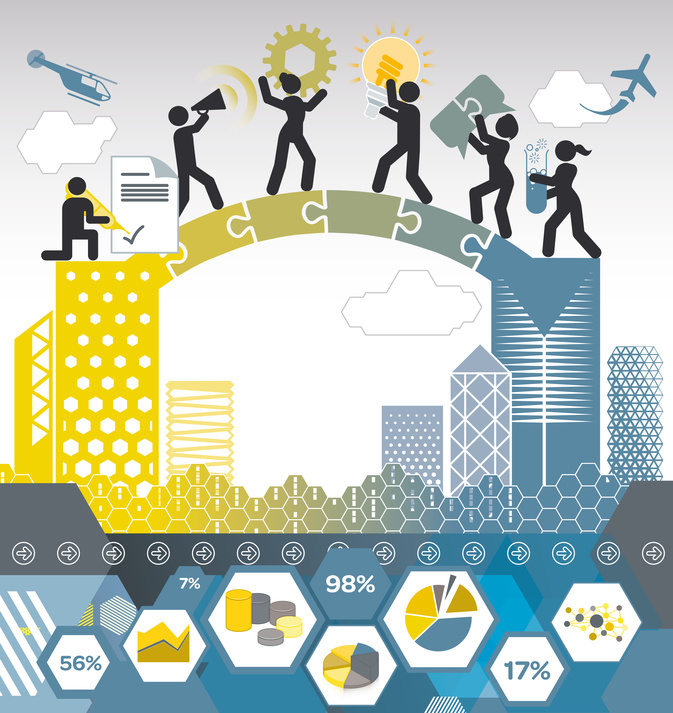 It stresses out the shared vision of the SEE economies to open up to 1 million new jobs by 2020, by enabling employment growth from 39% to 44%, increase of total regional trade turnover by more than double from 94 to 210 billion euro, the rise of the region’s GDP per capita from current 36% to 44% of the EU average, and the addition of 300,000 highly qualified people to the workforce. The video has been broadcasted at RTS main News programme on 1 November 2013. The Statement has been adopted at a meeting held on 21 November 2013 in Sarajevo, BiH. The opening address has been delivered at the conference held on 21 November 2013. The roundtable is taking place on 6-8 November 2013, in Sarajevo, Bosnia and Herzegovina. The strategy was endorsed by the ministers of science from the region, in Zagreb, on 25 October 2013. It was supported by the World Bank, the Regional Cooperation Council and the European Commission. 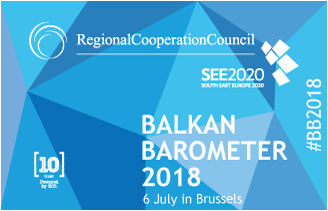 In the article, the RCC Secretary General writes about regional challenges and economic cooperation in South East Europe (SEE), featuring RCC’s SEE 2020 strategy. The report covers the period from 24 April to 20 September 2013, and reflects progress in implementation of the RCC Strategy and Work Programme 2011-2013. 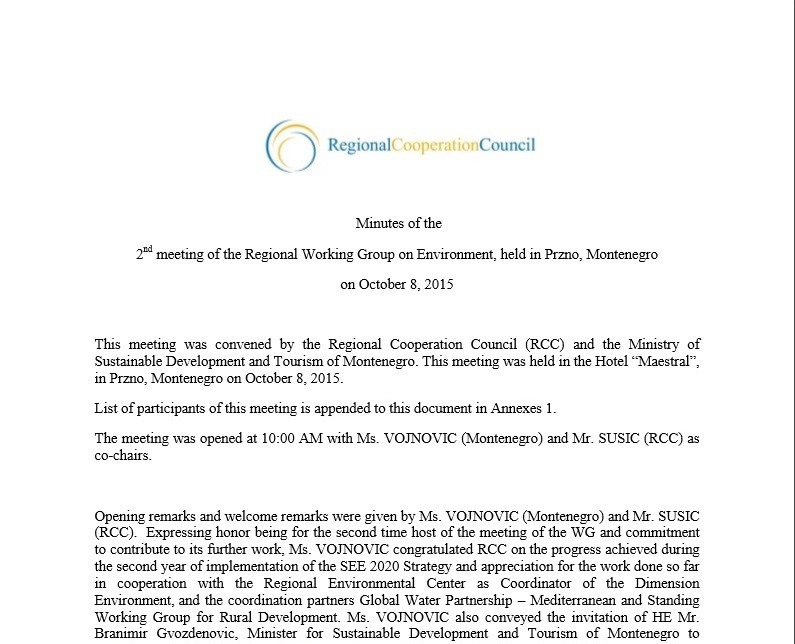 The notes were delivered at the opening of the RCC-co-organized three-day conference in Budva, Montenegro, on 27 September 2013. In the article, the RCC Secretary General is commenting regional cooperation in South East Europe and RCC’s role in that context, especially in relation to the preparation of the SEE 2020 strategy. Videos of RCC staff: Sanjin Arifagic, SEE 2020 Coordinator and Senior Expert on Economic and Social Development; Dinka Zivalj, Spokesperson; Mladen Dragasevic, Head of Building Human Capital and Cross Cutting Issues Unit; Miroslav Kukobat, Senior Expert on Energy and Infrastructure; and Svetlana Gligorovska, Expert on Infrastructure, featuring SEE 2020 strategy, at a workshop held in Sarajevo on 16 September 2013. The Secretary General of the RCC delivered the address at the closing of the Academy on Media Law in South East Europe, in Sarajevo on 5 September 2013. The speech was delivered on 3 September 2013 in Sarajevo, at the event organized under RCC auspices. In the interview the RCC Secretary General is speaking about the situation in Serbia, Belgrade-Prishtina relations, and regional cooperation. In the interview the RCC Secretary General speaks about Serbia’s EU integration, Belgrade-Prishtina agreement, impacts of Croatia’s EU entry, regional cooperation, and main goals of South East Europe (SEE) 2020 growth strategy. In the audio interview Senior RCC Expert on Building Human Capital and Cross Cutting Issues speaks about the RCC Task Force on Culture and Society and its projects, and featuring the South East Europe (SEE) 2020 growth strategy. The article, published at the portal of Al Jazeera Balkans, is a commentary of Croatia’s entry into the EU. The RCC Secretary General talks about political situation in South East Europe, regional cooperation and the RCC role, especially in relation to the SEE 2020 growth strategy. The article discusses regional cooperation, EU integration, SEE 2020 and Serbia in this context. The address was delivered in Tuzla, Bosnia and Herzegovina, on 5 June 2013. The address was delivered in Ohrid on 31 May 2013. The strategy was adopted by the RCC Board on 25 April 2013 in Sarajevo and endorsed by the participants of the RCC Annual Meeting, on 30 May 2013 in Ohrid. The report, endorsed by the participants of the RCC Annual Meeting, on 30 May 2013 in Ohrid, covers the period May 2012 – April 2013. The fifth RCC Annual Meeting was held on 30 May 2013 in Ohrid. The Permanent Council meeting of the Organization for Security and Co-operation in Europe (OSCE), was held in Vienna, on 2 May 2013. The document containing RCC Secretary General’s address also includes links to available responses by the missions to OSCE. The event, hosted by the Regional Cooperation Council (RCC) Secretariat, was held on 29 April 2013 in Sarajevo, Bosnia and Herzegovina. The address was delivered at the opening of RCC-hosted event in Sarajevo on 29 April 2013. In the interview RCC Secretary General speaks about Belgrade-Prishtina agreement, RCC activities and South East Europe (SEE) 2020 Strategy. The report covers the period from 18 February to 10 April 2013, and reflects progress in implementation of the RCC Strategy and Work Programme 2011-2013. In the interview, RCC Secretary General speaks about importance of regional cooperation in South East Europe (SEE), RCC activities and preparation of SEE 2020 Strategy. The meeting was held in Skopje on 10 April 2013. Adopted at the 12th SEEIC meeting, held in Sarajevo, on 19 March 2013. Secretary General Svilanovic talks about opportunities for the region under the new EU Instrument for Pre-accession Assistance (IPA II). The meeting was hosted by Radio-Television Slovenia, in Ljubljana, on 8 March 2013. The interview has been broadcasted in HRT's magazine ‘Horizonti’ on 27 February 2013. A panel discussion ‘Five years of Regional Cooperation Council: Building on foundations and embracing new challenges’, was a central element which marked the fifth anniversary of the Regional Cooperation Council (RCC), in Sarajevo on 27 February 2013. In the interview the RCC Secretary General speaks about development of South East Europe 2020 Strategy, activities of the RCC, region’s EU integration processes, neighbourly relations and cooperation in the region, visa-free regime for Western Balkans, etc. In the interview, the RCC Secretary General speaks about objectives of the South East Europe 2020 Strategy, current relations in the region, and his meetings with Serbia’s top officials in Belgrade last week. 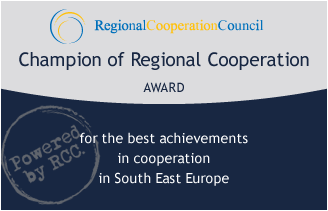 The International Peace Centre (IPC) Sarajevo awarded the RCC for the organization’s outstanding role in developing euro-regional cooperation in South East Europe and for the creation of a stable and safe atmosphere for economic and social development. In the interview, the RCC Secretary General speaks about South East Europe (SEE) 2020 Strategy, economic situation in SEE, priorities of RCC in its activity areas, region’s EU bids, etc. In the interview, broadcasted on TV1’s central newscast on 31 January 2013, the RCC Secretary General speaks about priorities of the organisation in the future period, importance of regional cooperation in Western Balkans’ EU accession process, RCC projects, etc. In the interview, the RCC Secretary General speaks about the future priorities of the organisation, regional cooperation in South East Europe (SEE), SEE 2020 Strategy, etc. 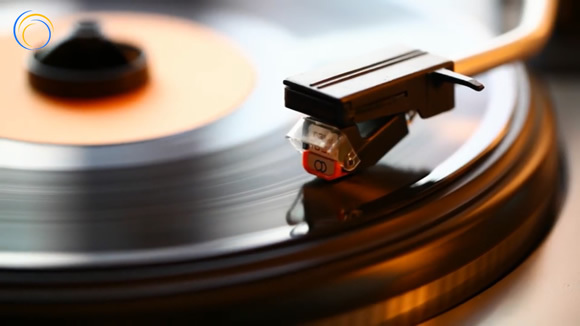 The interview was broadcasted on BHT1’s central newscast on 31 January 2013. 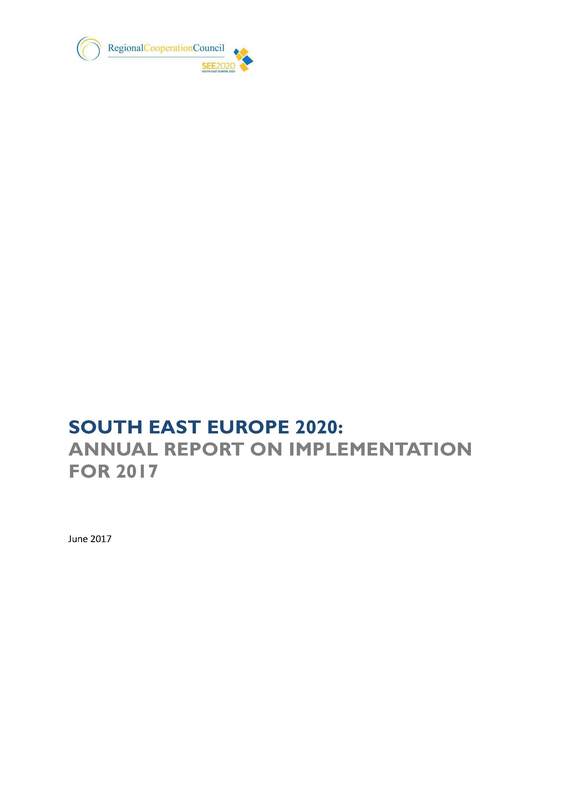 In the focus of the RCC Secretary General’s interview to SRNA, published yesterday, is South East Europe 2020 (SEE 2020) Strategy. In the interview, the RCC Secretary General talks about current state of regional cooperation, EU integration, dangers of abolishment of visa-free regime for the Balkan countries and the priorities in the RCC work. The address was delivered at the ministerial conference in Skopje, on 13 November 2012. The interview was published on 11 November 2012. The address was delivered at the conference held in Tirana, Albania, on 9 November 2012. Ministers of the Western Balkans economies adopted the statement at the conference ‘South East Europe 2020 – Towards Convergence and Growth’, held in Tirana, Albania on 9 November 2012. In the interview, published on 4 November 2012, the RCC Secretary General speaks about regional cooperation in South East Europe following the recent European Commission’s 2012 Enlargement Package. In the article, Deputy RCC Secretary General promotes RCC’s project ‘Les Femmes Des Balkans’, a CD of ethno music from South East Europe, performed by female soloists from the region. The address was delivered at a conference on financing digitalization in Eastern Europe, ‘The Challenge for Public Service Broadcasters’, held in Vienna, Austria, on 29 October 2012. The report covers the period from 4 May to 5 October 2012, and reflects progress in implementation of the RCC Strategy and Work Programme 2011-2013. In the interview, the RCC Secretary General speaks about visa and enlargement issues in the Western Balkans. The article, published in the September 2012 issue of the World Commerce Review, focuses on regional cooperation and development potentials in South East Europe. The event, co-organized by the Association of Consulting Engineers of Bosnia and Herzegovina (ACE BiH) and the Regional Cooperation Council (RCC) Secretariat, with support of the Ministry of Communications and Transport of Bosnia and Herzegovina, took place on 20-21 September in Sarajevo, Bosnia and Herzegovina. The third Governing Body meeting of the Implementation of Single European Sky (ISIS) Programme in South East Europe, which took place in Ohrid on 12 September 2012, was co-organized by the Regional Cooperation Council (RCC) Secretariat and the European Commission’s Directorate General for Mobility and Transport. In the interview the Deputy RCC Secretary General speaks about the regional cooperation in South East Europe. The Academy took place in Zagreb, Croatia, on 3-8 June 2012, with participation of media law practitioners from all of the countries in South East Europe as well as from relevant international organisations. It aimed at safeguarding media freedoms by enhancing regional cooperation and by building capacity of media lawyers to use the best national media laws and practices in the region in line with international and European media standards. The RCC Secretary General comments regional cooperation and EU integration process in South East Europe. In the interview, published on 24 June 2012, the RCC Secretary General speaks about the issues in the region and current political and economic situation that affects South East Europe. The address was delivered in Belgrade, Serbia, on 14 June 2012. The report, endorsed by the participants of the RCC Annual Meeting, on 13 June 2012 in Belgrade, Serbia, covers the period May 2011-May 2012. 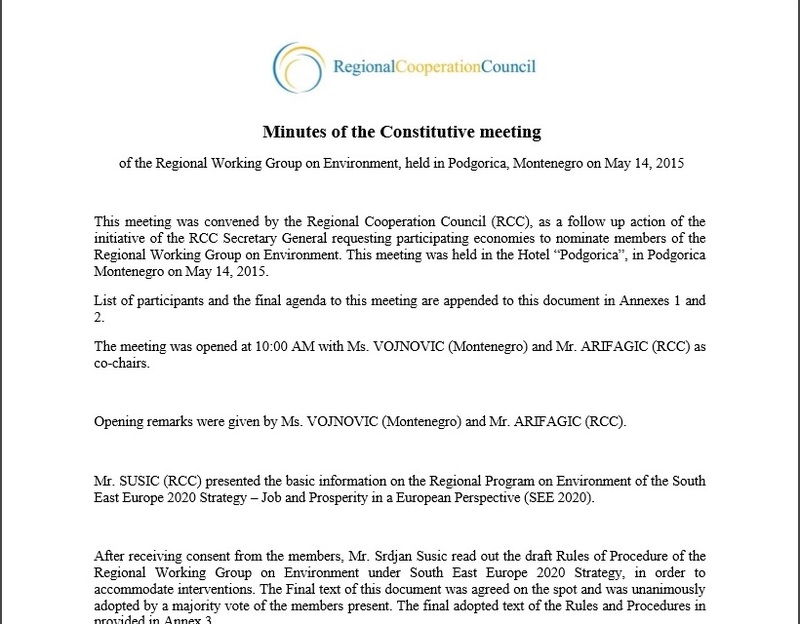 The fourth RCC Annual Meeting was held on 13 June 2012 in Belgrade, Serbia. In the interview, published on 7 June 2012, the RCC Secretary General speaks about regional cooperation in South East Europe. The address was delivered at the opening of the first academy on media law in South East Europe, in Zagreb, Croatia, on 4 June 2012. The week-long event has been organized under the auspices of the Regional Cooperation Council (RCC), with support of the Friedrich Ebert Foundation, the OSCE Representative on Freedom of the Media, and the OSCE Mission to Bosnia and Herzegovina. 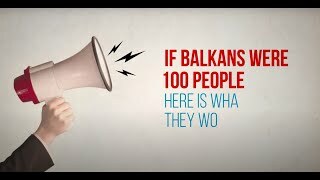 The project will be implemented by ARTICLE 19: Global Campaign for Free Expression and the European Association of Public Service Media in South East Europe. The event, which was co-organized by the Regional Cooperation Council, took place in Pula, Croatia, on 29-31 May 2012. The report covers the period from 6 March to 3 May 2012, and reflects progress in implementation of the RCC Strategy and Work Programme 2011-2013. The event, organized by the Ministry of Communications and Transport of Bosnia and Herzegovina, in partnership with the Regional Cooperation Council (RCC) Secretariat, the United Nations Development Programme, Microsoft, Oracle, Lexmark and One World – Platform for South East Europe Foundation, was held on 26 April 2012, in Sarajevo, Bosnia and Herzegovina. The SEEIC Work Programme 2012-2013 has been adopted at the meeting held under the umbrella of the Regional Cooperation Council Secretariat, in Sarajevo, Bosnia and Herzegovina on 24-25 April 2012. The article has been published in the first 2012 issue of ‘Die Südosteuropa Mitteilungen’, the journal of Southeast Europe Association. The meeting was held at RCC Secretariat in Sarajevo on 24-25 April 2012. The address was delivered at the 13th Bled Forum’s ‘Foresight Conference: Europe Beyond Smart – Inclusive – Sustainable, Throughout Cloud Computing Decade’, held in Bled, Slovenia, on 29-30 March 2012. Directors of eight South East European stock exchanges signed the Platform under the RCC Secretariat auspices, in Sarajevo on 27 March 2012. The report covers the period from 30 November 2011 to 5 March 2012, and reflects progress in implementation of the RCC Strategy and Work Programme 2011-2013. The panel discussion was held in Sarajevo, BiH, on 14 March 2012, to mark the 4th anniversary of the Regional Cooperation Council. The meeting took place on 31 January 2012, in Belgrade, Serbia. In the interview RCC Secretary General speaks about the RCC’s work and the regional cooperation in South East Europe. In the interview RCC Secretary General speaks about relations in South East Europe today as compared to 2008. In the interview Deputy RCC Secretary General speaks about RCC’s activities in 2011 and plans for 2012. The article speaks about regional cooperation in South East Europe. The article was published in the first issue of organization’s newsletter, from December 2011. In the interview, published on 23 December 2011, the RCC Secretary General speaks about the organization’s work and the regional cooperation in South East Europe. The report covers the period from 9 September - 30 November 2011, and reflects progress in implementation of the RCC Strategy and Work Programme 2011-2013. The 18th meeting of the Organization for Security and Co-operation in Europe (OSCE)’s Ministerial Council took place on 6-7 December 2011, in Vilnius, Lithuania. The event, organized by the Regional Cooperation Council Secretariat, took place on 1-2 December 2011 in Belgrade, Serbia. The two-day meeting, hosted by the RCC Secretariat, opened on 15 November 2011 in Sarajevo, Bosnia and Herzegovina. The seminar, co-organized by the European Commission (EC)’s Enlargement Directorate-General and the RCC Secretariat, with support of the European Association of Public Service Media in South East Europe and the European Broadcasting Union (EBU), was held on 14 November in Sarajevo, Bosnia and Herzegovina. 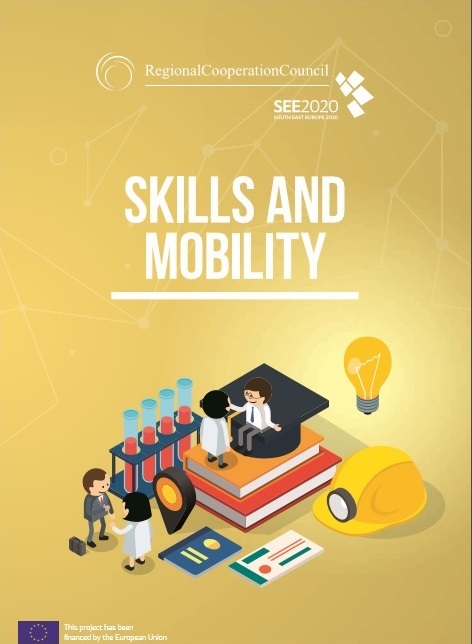 The article, containing statement by Jelica Minic, Deputy RCC Secretary General, focuses on the RCC co-organized regional conference “New Skills for New Jobs”, that took place in Sarajevo, Bosnia and Herzegovina, on 27-28 October 2011. The interview has been published on 19 October 2011. It has been carried by the Le Courrier des Balkans as well, on 26 October 2011. The address has been delivered at a two-day meeting on 13 October 2011 in Banja Luka, Bosnia and Herzegovina. The speech has been delivered on 7 October in Arandjelovac, Serbia. The speech has been delivered at the opening of the conference on 6 October in Sarajevo, Bosnia and Herzegovina. Address by RCC Secretary General, Hido Biscevic, at the signing of protocol on regional cooperation in education and training among members of the European Association of Public Service Media in South East Europe. The address has been delivered at the meeting in Sarajevo on 30 September 2011. The Protocol has been signed by directors general of 12 public broadcasters, as well by RCC and EBU, on 30 September 2011 in Sarajevo. This is the second, economic, part of the interview published on 29 September 2011. This is the first, political, part of the interview published on 25 September 2011. The report covers the period from 9 May 2011 to 9 September 2011, and reflects progress in implementation of the RCC Strategy and Work Programme 2011-2013. The meeting, co-organized by the Regional Cooperation Council Secretariat and the European Commission’s Directorate General for Mobility and Transport, was held on 7 September 2011 in Solin, Croatia. In the interview Deputy RCC Secretary General speaks about RCC’s role in regional cooperation in South East Europe, organization’s activities and its short and long-term goals. In the interview RCC Secretary General talks about activities of the organisation and regional cooperation in South East Europe. The document has been adopted on 30 June 2011 in Budva, Montenegro. The address was delivered in Budva, Montenegro. The report, endorsed by the participants of the RCC Annual Meeting, on 28 June 2011 in Becici, Montenegro, covers the period May 2010-May 2011. The third RCC Annual Meeting was held on 28 June 2011, in Becici, Montenegro. 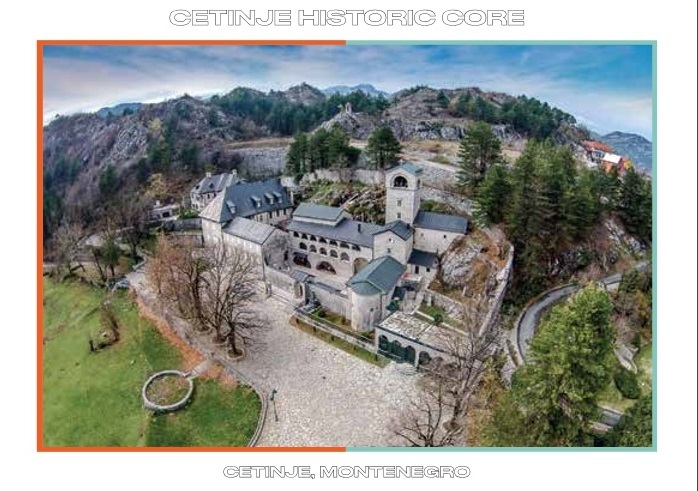 The article speaks about the Regional Cooperation Council’s Task Force on Culture and Society, launched last week and seated in Cetinje, Montenegro. In the interview, given prior to the third RCC Annual Meeting, which was held on 28 June 2011 in Becici, Montenegro, the RCC Secretary General speaks about the organisation’s past activities and future challenges. 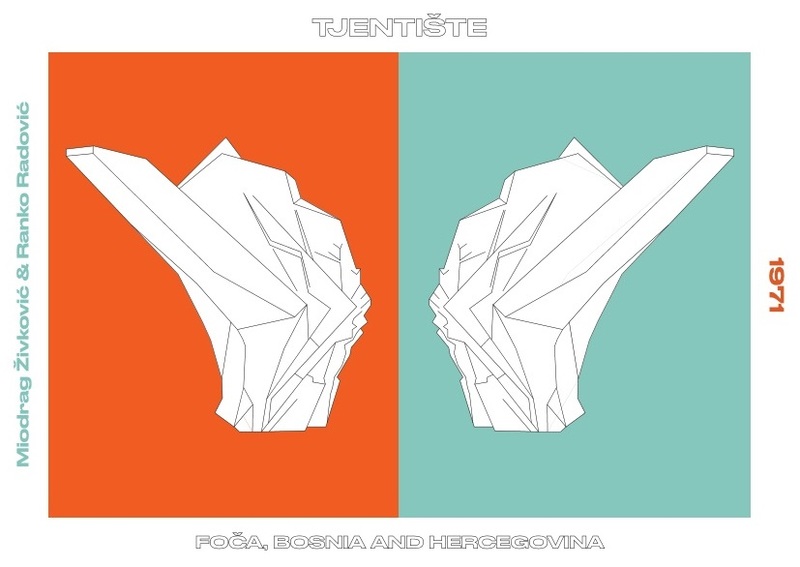 The event was held on 23 June 2011 in Cetinje, Montenegro. The document was adopted at a meeting in Becici, Montenegro, on 14-15 June 2011. The event was held on 14 June 2011 in Brussels. The event took place on 10 June 2011, in Trieste, Italy. The speech was delivered at the opening of RCC-organized conference in Sarajevo, Bosnia and Herzegovina, on 25 May 2011. 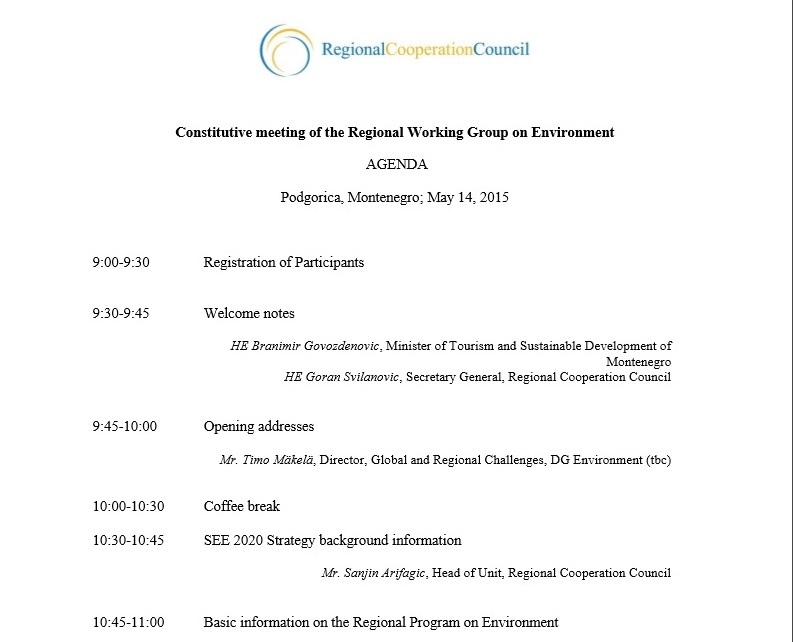 The meeting was hosted by the Regional Cooperation Council (RCC) Secretariat in Sarajevo, on 17 May 2011. The report covers the period from 9 March 2011 to 9 May 2011, and reflects progress in implementation of the RCC Strategy and Work Programme 2011-2013. The event was held on 6 May 2011 in Brussels. The event, co-organized by the Association of Consulting Engineers of Bosnia and Herzegovina and Regional Cooperation Council Secretariat, was held on 20 April in Sarajevo, Bosnia and Herzegovina. The Permanent Council meeting of the Organization for Security and Co-operation in Europe (OSCE), was held in Vienna, on 14 April 2011. The document containing RCC Secretary General’s address also includes links to available responses by the missions to OSCE. In the interview, RCC Secretary General speaks about the conference ‘Western Balkans and Europe 2020 – Towards Convergence and Growth’, organized by RCC on 30-31 March 2011 in Brussels, as well as about RCC activities in general. The article reports on the conference ‘Western Balkans and Europe 2020 – Towards Convergence and Growth’, organized by the Regional Cooperation Council Secretariat on 30-31 March in Brussels. The document was presented at the RCC-organized conference ‘Western Balkans and Europe 2020 – Towards Convergence and Growth’, on 30-31 March 2011 in Brussels. The event, that gathered over 100 participants, was held in Brussels, Belgium on 30-31 March 2011. The article reports on the opening of the conference ‘Western Balkans and Europe 2020 – Towards Convergence and Growth’, organized by the Regional Cooperation Council Secretariat on 30-31 March in Brussels. The article reports on the meeting on the role of national parliaments in Western Balkans and Turkey in negotiations for EU accession, co-organized by the Regional Cooperation Council Secretariat and the European Commission’s Enlargement Directorate-General on 17-18 March in Sarajevo. The Strategic Document was endorsed by the Ministers in Budva, Montenegro, on 18 March 2011. The Declaration was adopted by the Ministers in Budva, Montenegro, on 18 March 2011. Article on cross-border cooperation in Western Balkans, with references to Regional Cooperation Council. The article, published at TransConflict and Eurasia Review websites, was originally written by Development and Transition, a joint project of the United Nations Development Programme (UNDP) in Europe and the CIS and the London School of Economics (LSE). The meeting of parliamentarians from Western Balkans and Turkey took place in the premises of RCC Secretariat in Sarajevo, Bosnia and Herzegovina, on 17-18 March 2011. The SEECP ministerial conference ‘Strengthening Co-operation in Fight against Organized Crime in South East Europe’ was held in Budva, Montenegro on 16-18 March 2011. The meeting of the defense ministers of the South-East European Cooperation Process was held in Budva, Montenegro on 14-15 March 2011. In the interview, Deputy RCC Secretary General speaks about RCC activities and regional cooperation with emphasis on Bosnia and Herzegovina. The report covers the period from 4 December 2010 to 4 March 2011, and reflects progress in implementation of the RCC Strategy and Work Programme 2011-2013. The panel discussion was held in Sarajevo, BiH, on 7 March 2011, to mark the third anniversary of the Regional Cooperation Council. In the interview, RCC Secretary General speaks about cooperation in South East Europe and the necessity to transform positive regional climate into concrete economic cooperation. The study, conducted among nine members of the Regional Cooperation Council (RCC) from South East Europe, has been coordinated by the RCC and prepared by Transparency International (TI) Romania and its partners, together with the Regional Anti-corruption Initiative (RAI). The results of the Survey have been analyzed during the 2010 Anticorruption Conference held in Bucharest, organized by RCC, RAI, TI Romania, Romanian Ministry of Justice and Ministry of Security of Bosnia and Herzegovina. In the article, Secretary General writes about regional cooperation in South East Europe in 2010. In the interview, the RCC Secretary General talks about the activities of the organization over the past three years, as well as future prospects. The report covers the period from 11 September to 26 November 2010, and reflects progress in implementation of the RCC Strategy and Work Programme 2011-2013. The address was delivered at the opening of the two-day event, dedicated to finalization of drafting of the South East European Regional Strategic Document and Action Plan 2011-2013 in the area of justice, home affairs and security cooperation, held under RCC auspices in Sarajevo, BiH. In the interview, the Deputy RCC Secretary General speaks about the regional cooperation in South East Europe, with an emphasis to economic cooperation. The address titled “Working Together in Strengthening EU Perspectives: the Role of the RCC” was delivered on 23 November 2010 in Brussels. In the interview, Secretary General Biscevic speaks about the RCC and its activities, and regional cooperation in general with emphasis on security cooperation. This regional event, that took place on 20-21 October 2010, in the Regional Cooperation Council (RCC) Secretariat in Sarajevo, discussed the inspectors’ contribution to modernizing educational systems in South East Europe. The RCC Secretary General Hido Biscevic and the EBU Vice-President Claudio Cappon signed these conclusions on 15 October 2010 in Sarajevo, BiH. The opening address refers to the international conference ‘Addressing Europe’s Digital Divide: Towards Sustainable Public Service Media in South East Europe’, held in RCC Secretariat on 14-15 October 2010. 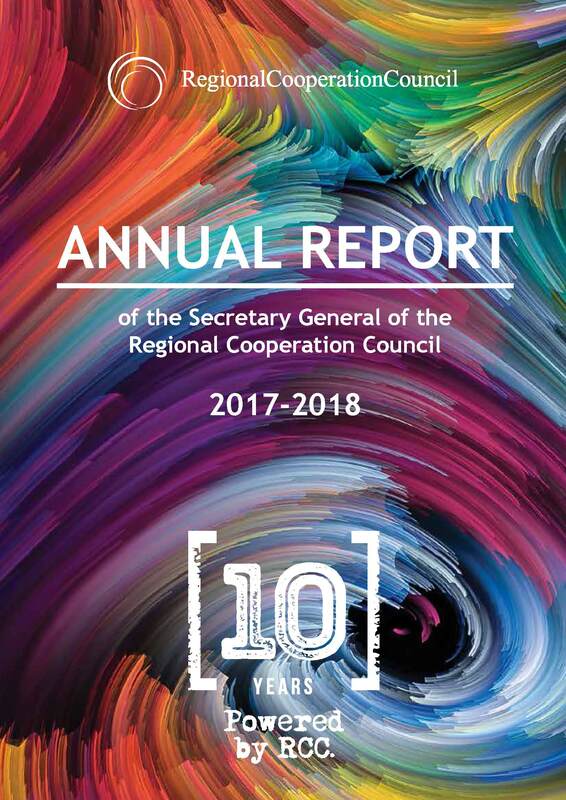 The article is about the Strategy and Work Programme 2011-2013 of the Regional Cooperation Council (RCC) and carries statements of RCC Secretary General, Hido Biscevic, and his Deputy, Jelica Minic. 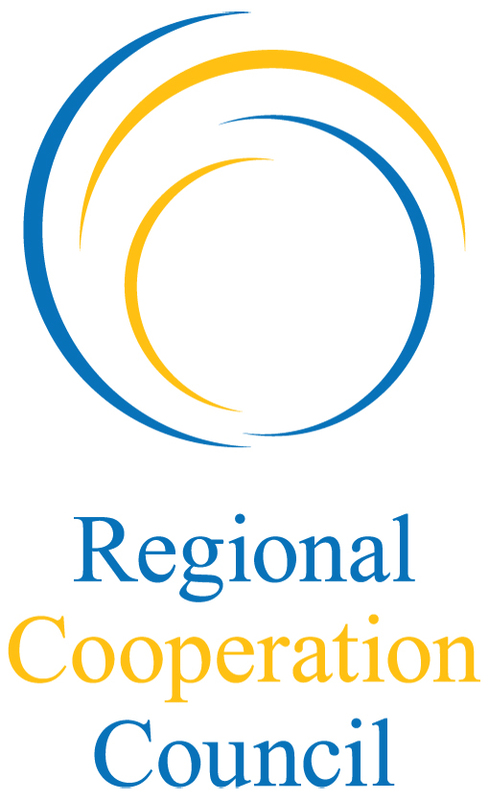 In the interview, the RCC Secretary General talks about the Regional Cooperation Council, its activities so far and the organization’s Strategy and Work Programme 2011-2013. Secretary General Biscevic writes about the new spirit of rapprochement in Western Balkans and the ways it can be advanced, also in light of the RCC strategy for the next three years, endorsed last month by South East European heads of state and government. The conference examined the opportunities, risks, and constraints to public-private partnership development in South East Europe, as well as the role these partnerships could potentially play in the context of national and regional development strategies. The document gives an overview of selected economic indicators for South East Europe (SEE) for the first six months of 2009. Croatia's leading political weekly Nacional gives an overview of the Regional Cooperation Council and its activities, imbedding segments of an interview with the RCC Secretary General Hido Biscevic into the article. Description: The theme of the Croatia Summit 2009, held in Dubrovnik, was “Europe’s Strategic Imperative: Energy, Investment and Development”. The topic of the address is “Challenges for the Development of South East Europe“. Lecture by the Minister of State at the German Foreign Office, Gernot Erler, on regional cooperation, stability and way to the EU, held on 10 March 2009 at the premises of the Regional Cooperation Council (RCC) Secretariat in Sarajevo. Report to the RCC Board on the activities of the RCC Secretariat, for the period 1 October-5 December 2008. The Action Plan represents the outcome of a joint effort of interested South East European countries in creating a common platform for sub-regional cooperation in addressing the climate change. The Joint Statement was adopted by environmental ministers of Albania, Bosnia and Herzegovina, The Former Yugoslav Republic of Macedonia, Montenegro and Serbia, at the first ministerial conference on "Combating Climate Change in South East Europe", held in Sarajevo, Bosnia and Herzegovina, on 14 November 2008. This is the advanced copy of the study “Defining and Strengthening Sector Specific Sources of Competitiveness in the Western Balkans – Recommendation for a Regional Investment Strategy”, prepared by OECD experts, with financial support of the European Commission, and in cooperation with the Regional Cooperation Council. Report to the RCC Board on the activities of the RCC Secretariat, for the period 20 May-1 October 2008. The roundtable was a part of the hand-over activities between the Stability Pact for South Eastern Europe and the Regional Cooperation Council.